La Madeleine is a rock shelter located in the Vézère valley, in the Dordogne, France. In 1926 the skeleton of a three year old child was discovered, with exquisite shell jewellery, dating from the end of the Magdalenian period. 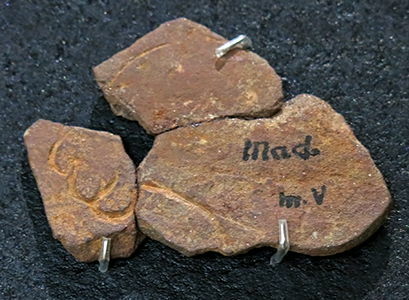 It is a treasure house of art and knowledge about the people of the Magdalenian. Much of this art is on display at the Musée National de Préhistoire, Les Eyzies-de-Tayac. View down the Vézère valley from the Medieval La Madeleine rock shelter. Aerial photograph of the location of La Madeleine on the Vézère River. Note that according to the legend on this photograph, the gisement, or archaeological site, of La Madeleine is not accessible to the public. Thus the rock shelter used in mediaeval times shown above may or may not have been used during the Magdalenian. I would appreciate further information on this point. However it seems certain that the major archaeological site is further downstream from the cave shown above. I understand that the gisement of La Madeleine, an historic monument since October 1956, is now private property. Another view of la Madeleine. 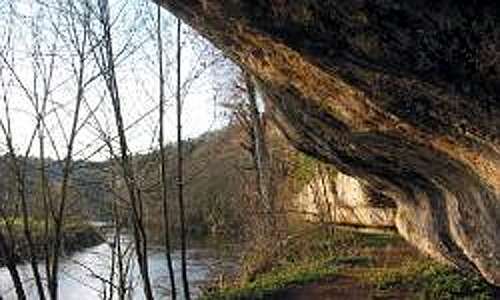 Looking upstream along the Vézère River from the Medieval Rock Shelter at the tourist site of La Madeleine. Maps showing a) the extent of the Magdelanian, as well as the the maximum extent of Weichselian glaciations (the last glacial maximum, LGM, between 26 500 and 19 000 - 20 000 BP) and distribution of loess covers in Europe (orange patches); b) the Late Weichselian major glacial phases (Pz = Poznan, Pm = Pomerania, Ga = Gardno, Sb = Stupsk Bank, Sm = Southern Middle Bank), distribution of loess covers in Poland (orange patches). 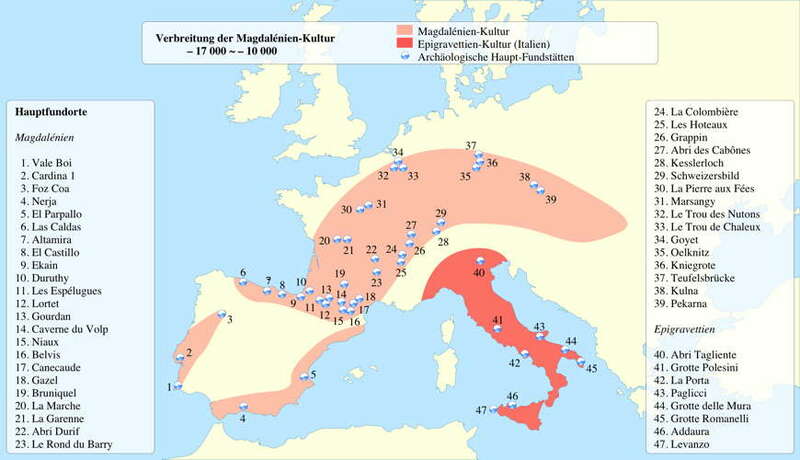 Location map of Homo Sapiens during Magdalenian culture, between 17 000 ~ 10 000 BP. The next spring, they continued their research. In May 1864 workers discovered five fragments of an ivory plate, which once reassembled, revealed an exceptional engraving of a mammoth. 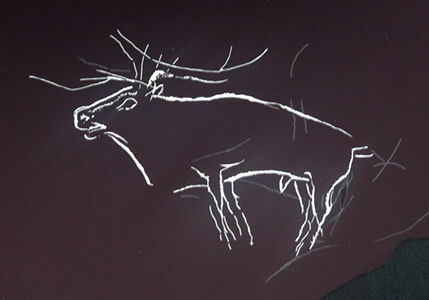 The accuracy of the engraving confirmed without doubt that the artist had observed the living creature and reproduced it in accurate detail: wooly coat, tusks, and hump were all faithfully recorded. The rear end of the animal was also clearly defined. 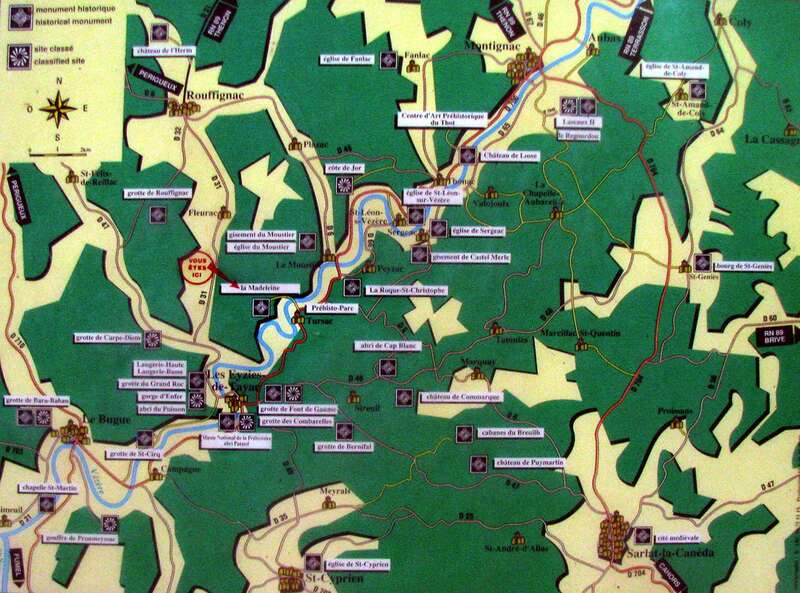 Map of the shelter of La Madeleine. The plan of the gisement at la Madeleine by Capitan and Peyrony, as well as some cross sections. 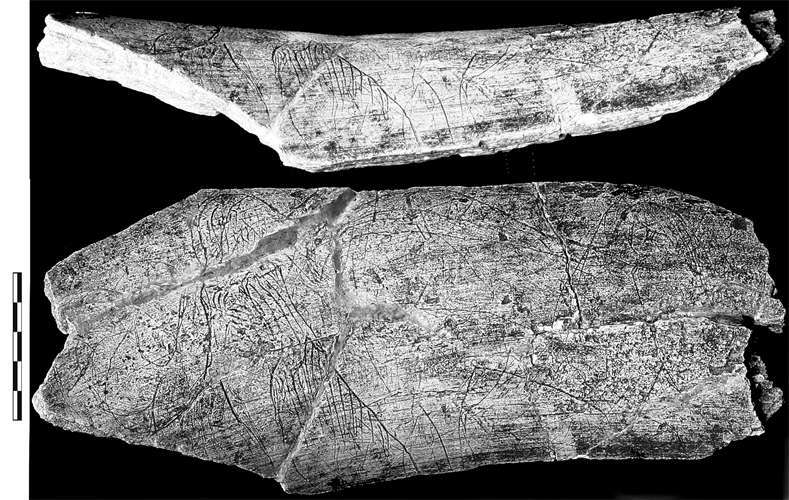 Woolly mammoth engraved on a plate of ivory found in La Madeleine. A recent photograph of the mammoth from La Madeleine. In its present size, the fragment of La Madeleine mammoth ivory measures 248 mm long and 106 mm width. 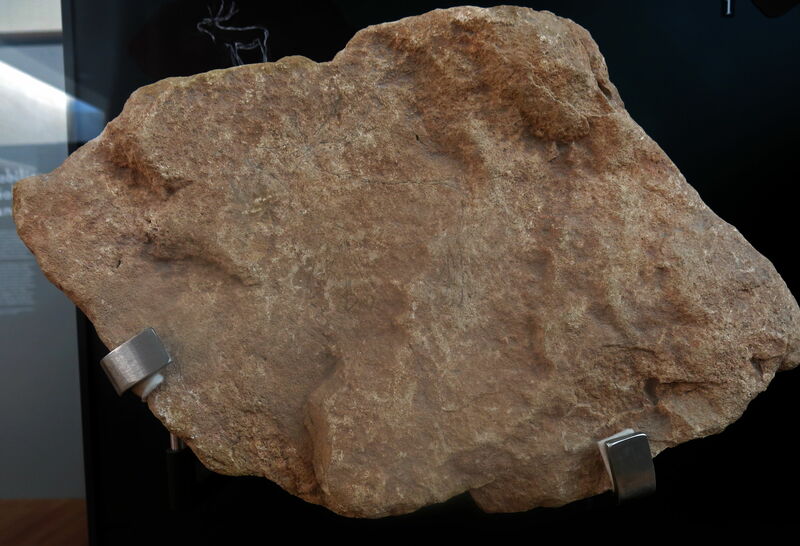 Its thickness is 18 mm section on the left side and 8 mm on the fracture. 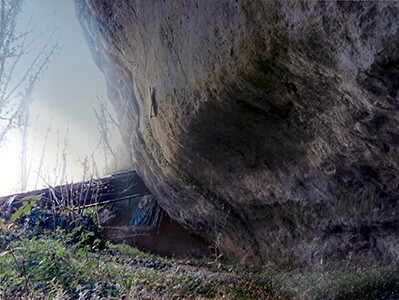 Photo: © Patrick Paillet (2009) avec l’autorisation du Département « Histoire de la Terre », Muséum national d’histoire naturelle. The original mammoth from La Madeleine. 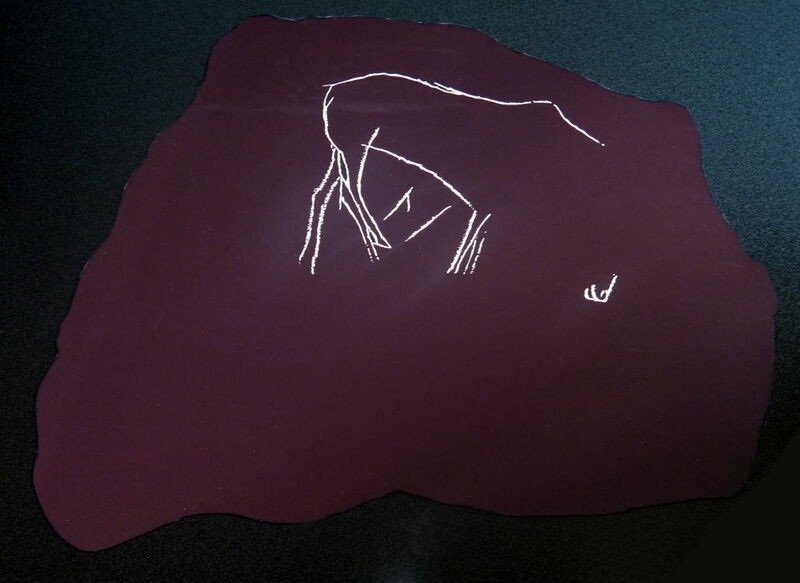 A recent tracing of the mammoth from La Madeleine. 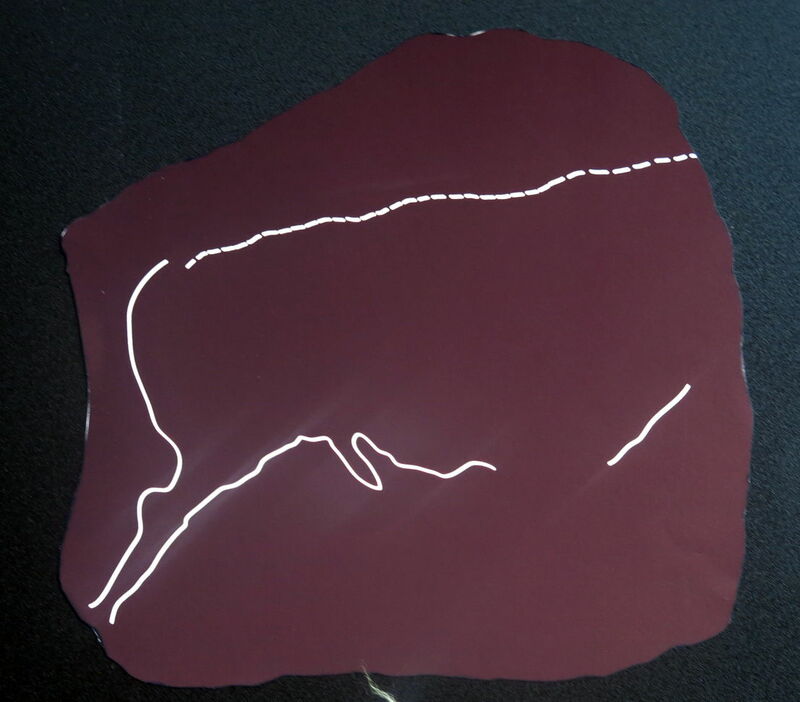 A selective tracing of the mammoth from La Madeleine. 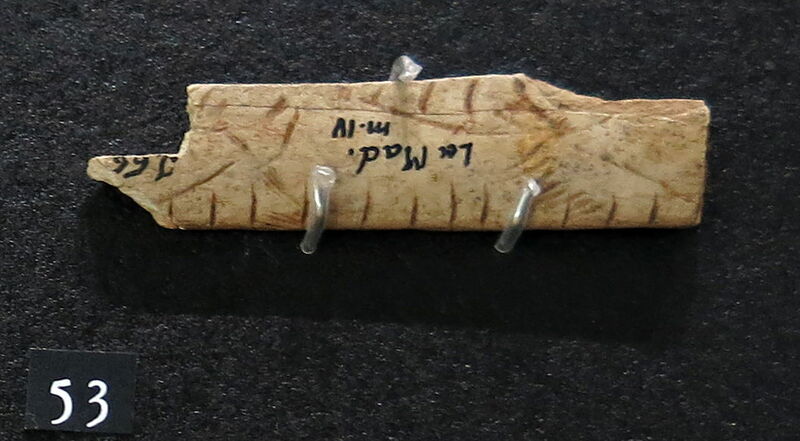 The back of the piece of ivory on which the woolly mammoth was engraved in La Madeleine. 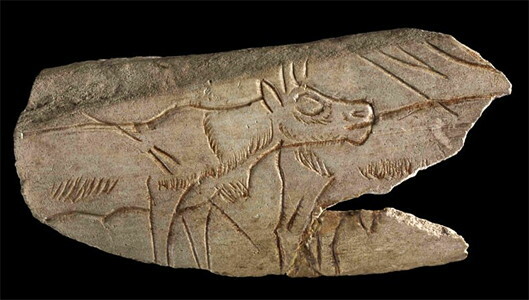 Reindeer and calf on a slab of limestone, from the excavations of Peyrony. Female reindeer and calf engraved on a stone block. Such careful and realistic representation is typical of Leroi-Gourhan's late Style IV, from La Madeleine, Dordogne. 65 cm in length. 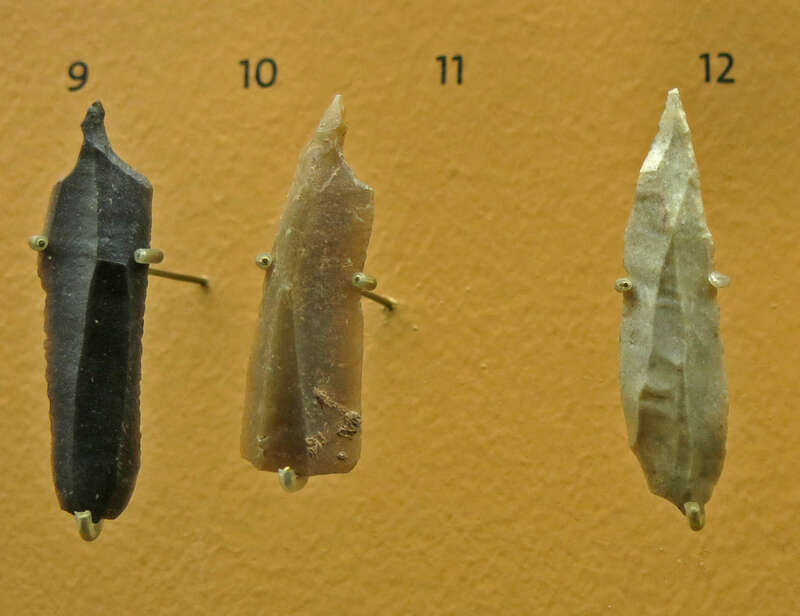 • Ciseau, chisel or wedge. • Lissoir, polisher, used to stretch hides during the tanning process. 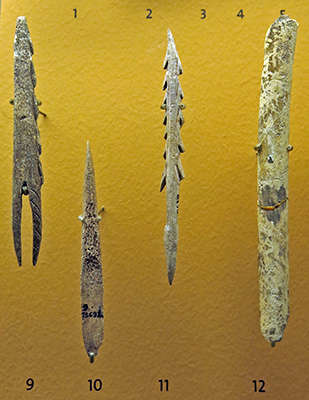 • Poinçon, awl, used to make holes in hides preparatory to sewing. • Pointe double, thin rod sharpened at each end. 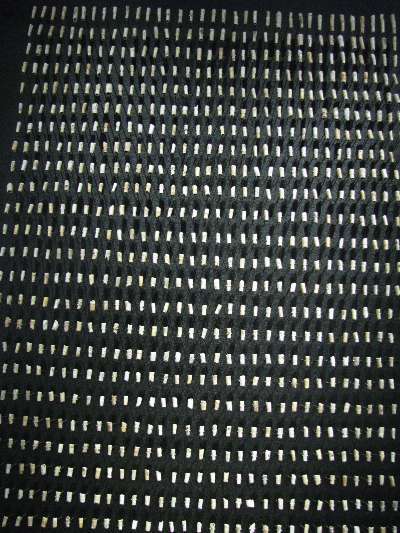 • Pendeloques, pendants, apparently of cave bear teeth. 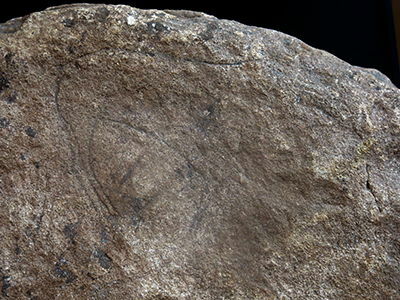 • Sagaie à base fourchue sculptée, engraved spear point with forked base. • Sagaie à biseau simple, spear point with a single bevel base. 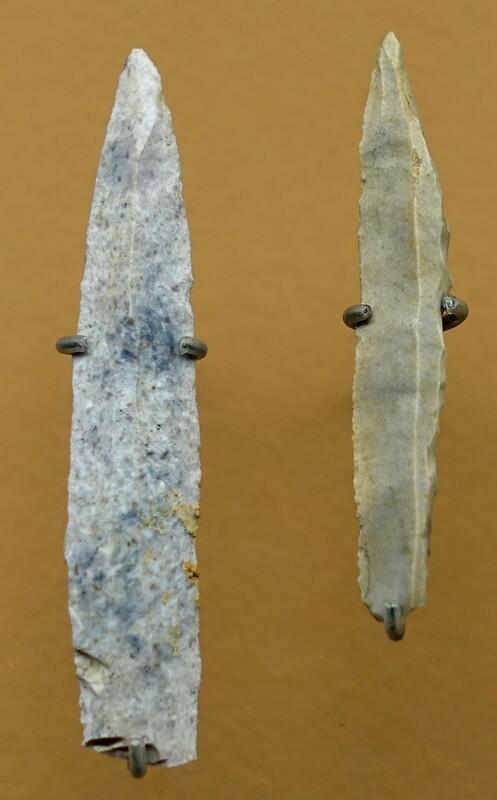 • Baguette demi-ronde, half cylindrical spear point, one of a pair. • Sagaie à biseau double, spear point with a double bevel base. • Pointe de Laugerie-Basse, point typical of some points from Laugerie-Basse. 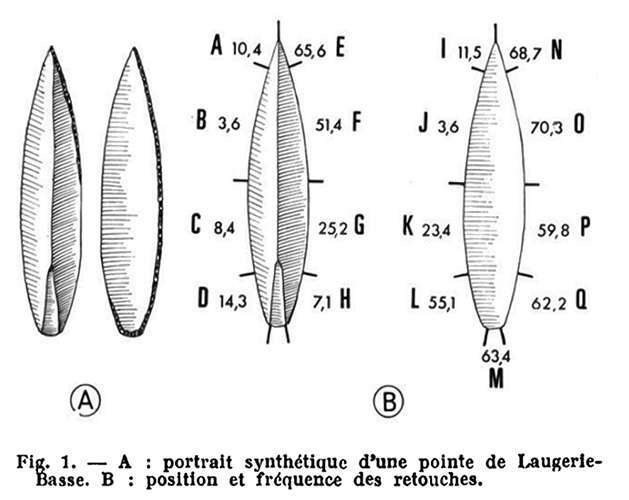 The Laugerie-Basse point shown in the drawing on the right has a particular shape and method of retouch which makes it quite unique. • Four lamelles à dos, small backed blades. • One lamelle denticulé, small toothed blade. (right photo, on left of photo): Grattoir double, scraper on each end of the tool. (right photo, centre and right): Grattoirs , scrapers. Parrot beaked burin from la Madeleine. 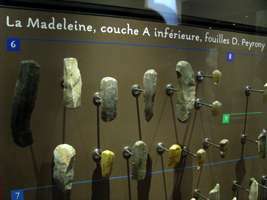 In 1868 Gabriel de Martillet established a new timescale for the prehistoric centuries, and La Madeleine became the type site for "Magdalenian" times. Bâton percé in deer antler. 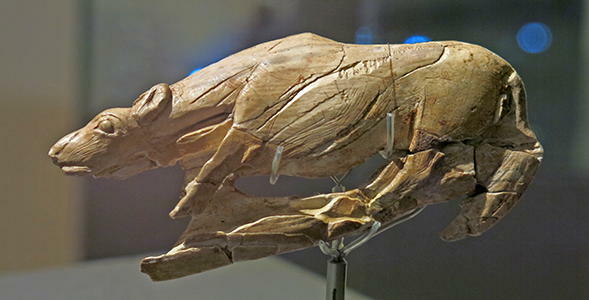 Magdalenian, between 17 000 and 10 000 BP. La Madeleine, Tursac, Dordogne, France. Former collection of Édouard Lartet (1801 - 1871), Muséum of Toulouse. 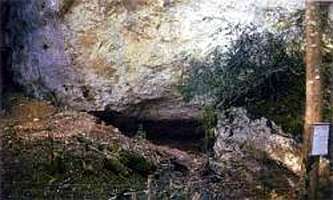 The site was also studied by Paul Girod and Elie Massenet, as well as numerous amateur investigators. 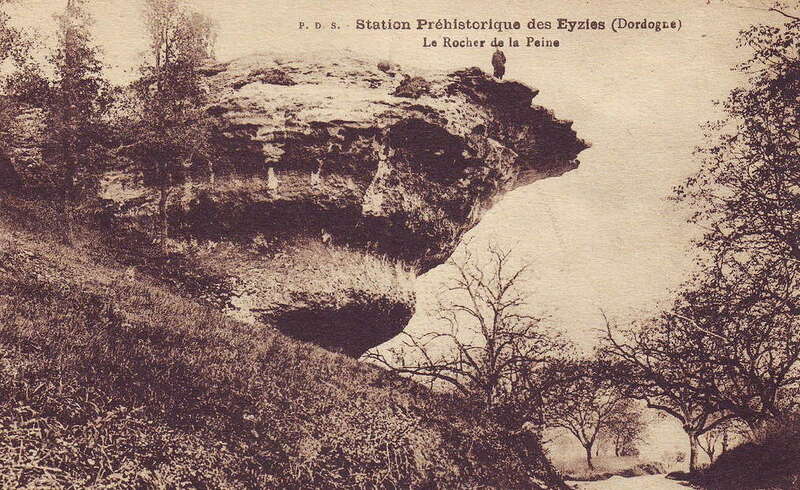 Denis Peyrony restarted the research in 1911, and refined knowledge of the site. In 1926 the skeleton of a three year old child was discovered, with exquisite shell jewellery, dating from the end of the Magdalenian period. In 1968, following several years without further developments, the research was restarted by Jean-Marc Bouvier. 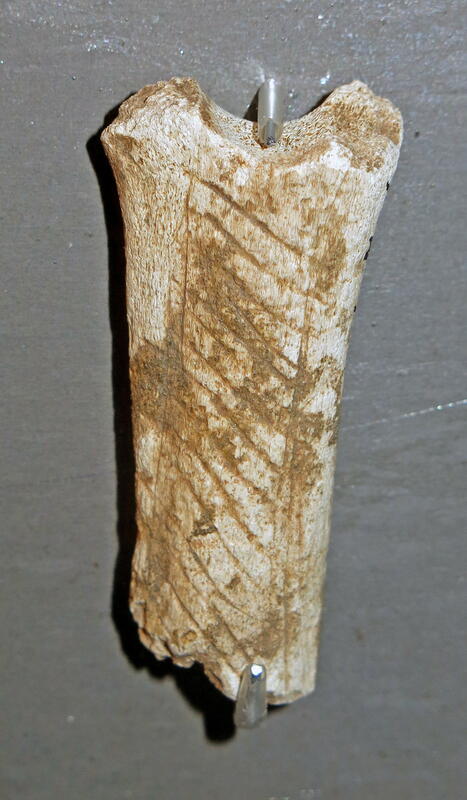 Fragment of decorated reindeer metatarsal (bone) engraved on the obverse surface with two reindeer, one of which is now incomplete; decorated bone; Palaeolithic; Madeleine, France. 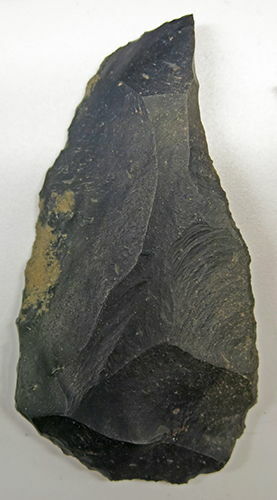 Assegai (spear point) with double beveled base from la Madeleine. Two views of the same object. Sagaie à base biseautée double. Deux vues du même objet. Permission: licensed under the Creative Commons Attribution-Share Alike 2.0 France license. These are exceptionally well made tools from La Madeleine. 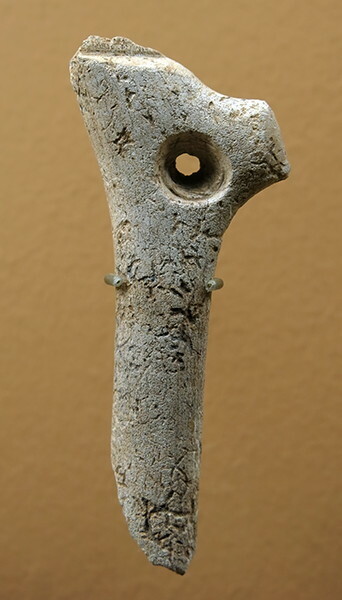 Perforated baton with low relief horse, 16.6 cm long. Between about 14 000 and 10 000 years ago, many objects made of bone and antler were decorated with animals. At La Madeleine, horses seem to have been a particular favourite. 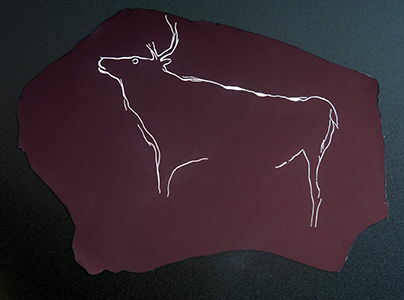 Here the surface of the antler around the outline of the horse has been scraped away, so the body stands out in low relief. The line of the horses' chest, the way in which the front legs point towards the back and the upward position of the tail all suggest that the animal is running. 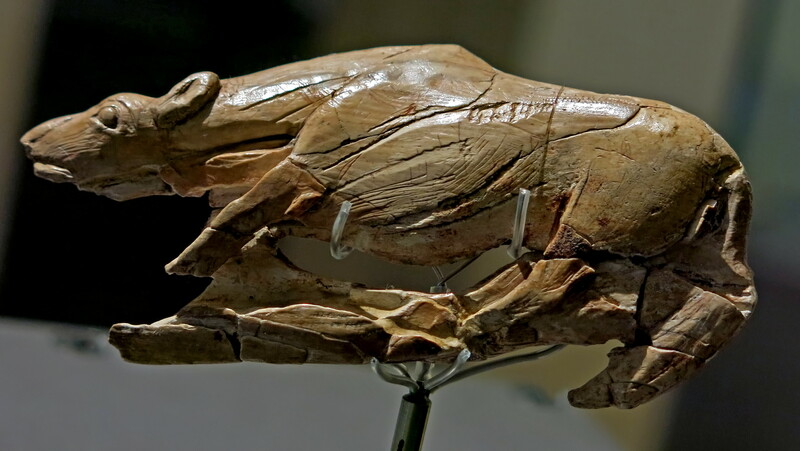 Its head and eye are large and not accurately to scale with the body. This may be the artist's way of emphasising the character of the animal in a small space. 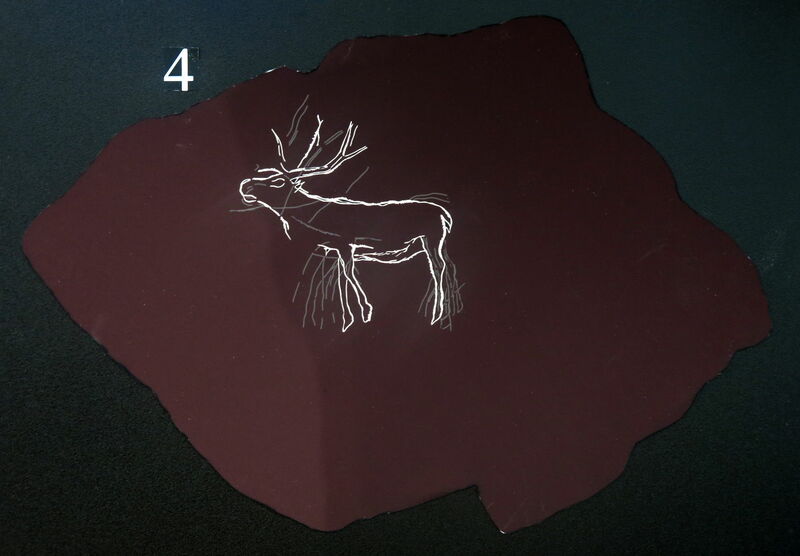 It is a common technique in portable art, but one that is rarely seen in the painted cave art of the period. 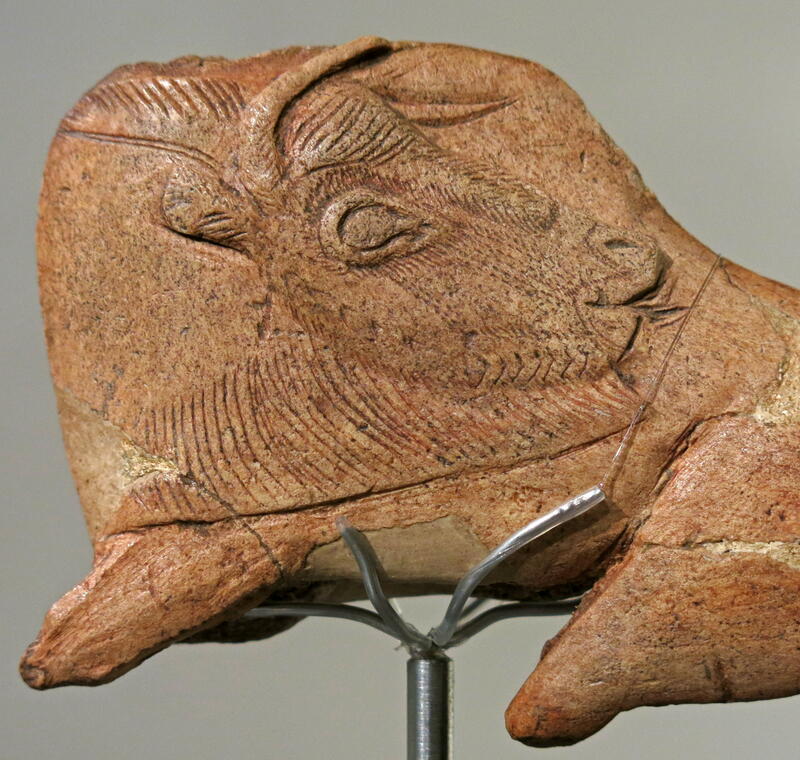 Same object as above, perforated baton with low relief horse, Late Magdalenian, about 12 500 years old, from the rock shelter of La Madeleine, Dordogne, France. 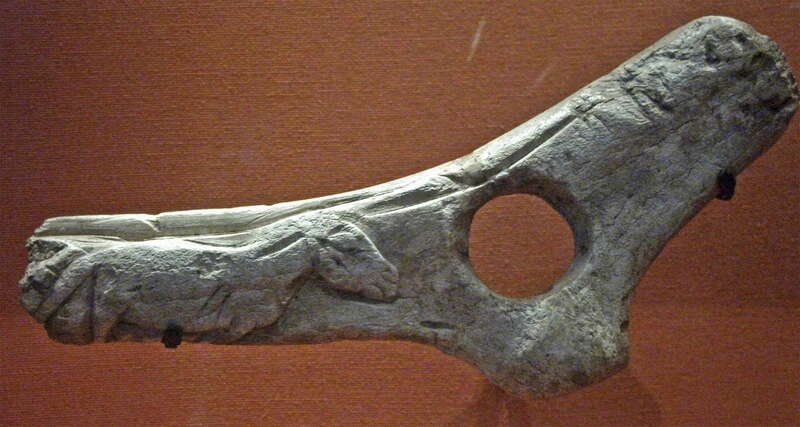 Made from reindeer antler, on display in the British Museum. 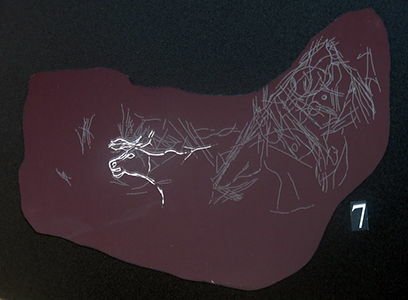 Bâton percé gravé figurant une file de chevaux, spear straightener engraved with a line of three horses. 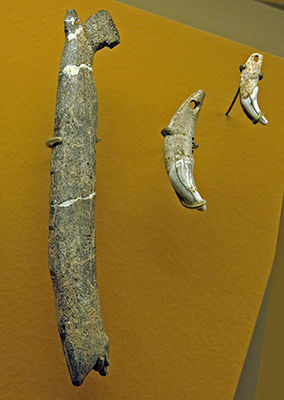 13 000 BP, reindeer antler, 31 cm long. Pierced batons from la Madeleine. 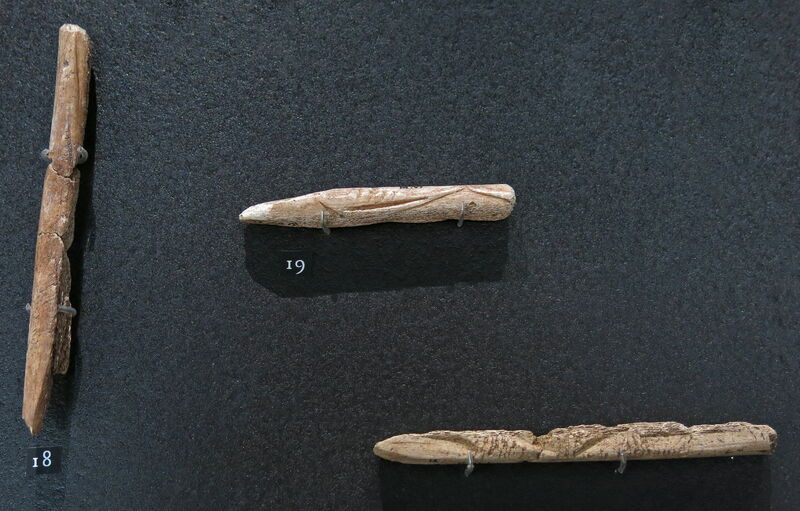 (right) Pierced baton from La Madeleine, Tursac, in reindeer antler. 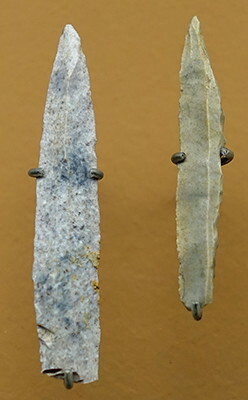 (left) Pierced baton from Cap Blanc. Fish carved in reindeer antler. Carving of a feline on antler. Carving of a deer head on the point of a deer antler. 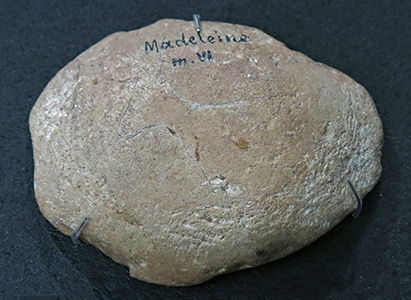 Compresseur from la Madeleine, Upper Magdalenian. 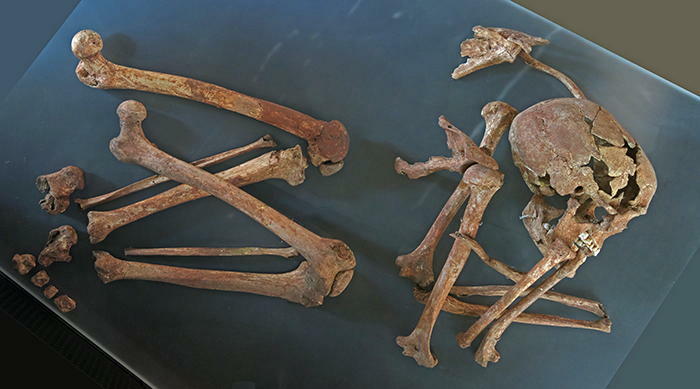 The skeleton of the child burial at La Madeleine. La structure funéraire reste modeste: une simple fosse accueille le corps allongé sur le dos; la tête placée au Sud, est entourée de trois pierres. Cette simplicité contraste avec une parure exceptionelle (présentée ci-contre), probablement ocrée, composée de près de 1500 pièces réparties sur le corps. 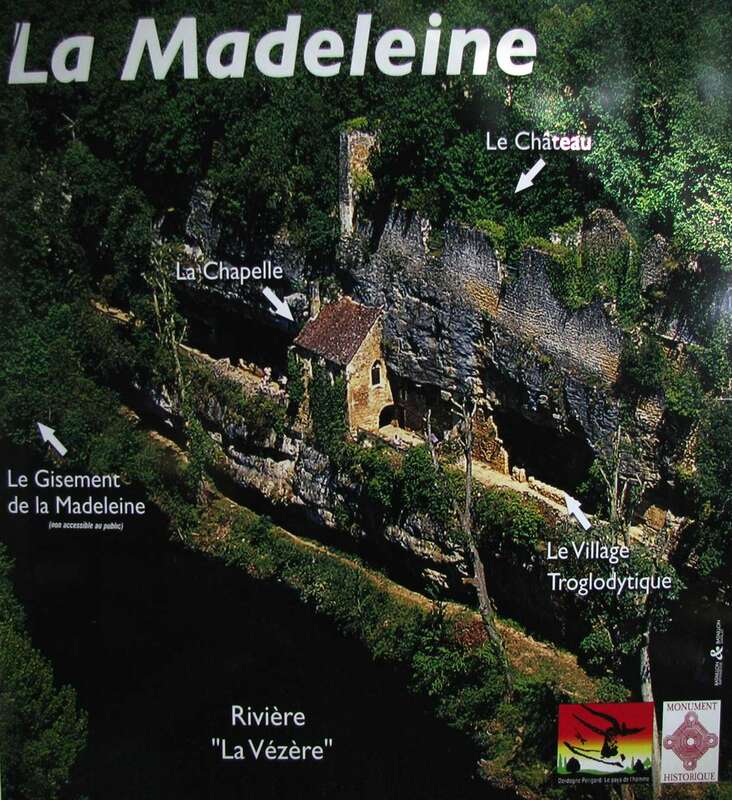 La parure de l'enfant de La Madeleine (Tursac, Dordogne) est fortement enracinée dans le monde magdalénien, bien que datée de 10 190 ± 100 B.P. En 1927, Denis Peyrony la découvrit ainsi: " [Le] squelette était allongé, étendu sur le dos, suivant la direction Nord-Sud, la tête vers ce dernier point [...]. De nombreux petits coquillages perforés (dentales et turritelles) et des dents percées, se trouvaient dans la région des chevilles, des genoux, des poignets, des coudes, du cou et de la tête [...]. 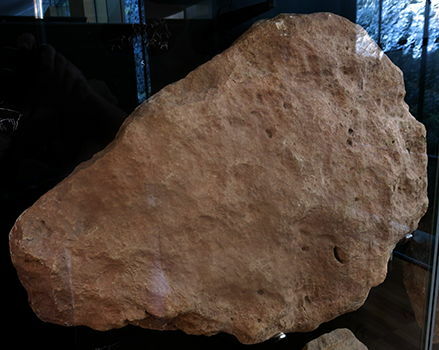 Le cadavre de cet enfant enduit de rouge (saupoudré d'ocre, ou plus vraisemblablement peint avec cette matière), avait été déposé là soigneusement, orné d'une riche parure". L'analyse récente des objets renseigne sur la fabrication, l'assemblage et l'utilisation de cette parure. L'usure des coquillages, tronçonnés en tubes de petite taille, indique que les dentales auraient pu être cousus sur l'habit et que l'enfant aurait pu porter le vêtement de son vivant. Le nombre d'objets impliqués et le temps nécessaire à la réalisation de cette parure évoquent une motivation dépassant l'affection parentale. Serait-ce lié à une hiérarchisation sociétale à base héréditaire ou à un statut social propre à cette classe d'âge dans les sociétés de la fin du Paléolithique Supérieur? 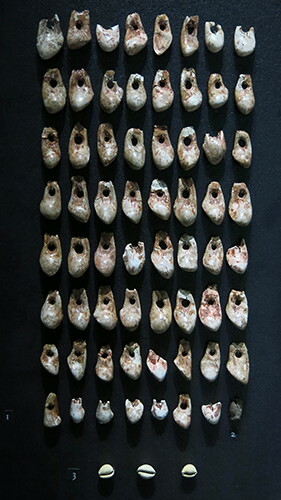 The parure (a parure is a set of various items of matching jewellery) of the child from La Madeleine is strongly rooted in the Magdalenian world, although dated 10 190 ± 100 BP, at the very end of the period. 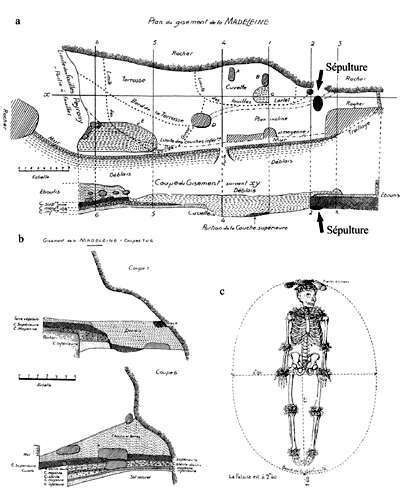 In 1927, Denis Peyrony discovered the burial: "The skeleton was lying, stretched out on its back, in the North-South direction, head to the South.... 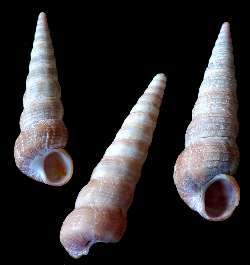 Many small perforated shells (Dentalia and Turritella) and pierced teeth were in the region of the ankles, knees, wrists, elbows, neck and head. The corpse of the child, which was covered with red ochre (sprinkled, or more likely painted with ochre), was removed carefully, and was decorated with a rich parure. The child wore seashells, cut into small tubes, so that the Dentalia shells could be sewn onto the garment, and the child could wear the vestments for the rest of time. The number of objects involved and the time required to achieve this dress evoke motivation beyond parental affection. 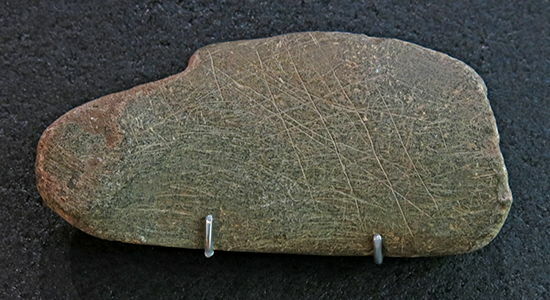 Could this be related to a social hierarchy based hereditary or social status specific to this age group in the societies of the late Upper Palaeolithic? Excavated by D. Peyrony in 1926 (Peyrony 1926, 1927, Capitan et Peyrony 1928) in the eponymous site of the Magdalenian, the tomb of the La Madeleine child was discovered in a strongly ochred depression, located in the eastern part of the shelter 260 cm from the wall. Although Peyrony estimated the remains to be of a child of 5 to 7 years old, they correspond more closely to an individual aged between 2 and 4 years of age. The child had been deposited lying on the back. The head, facing south, was surrounded by three stones and decorated, as was the neck, elbows, wrists, knees and ankles by "many small shells and perforated teeth" (Capitan et Peyrony, 1928). 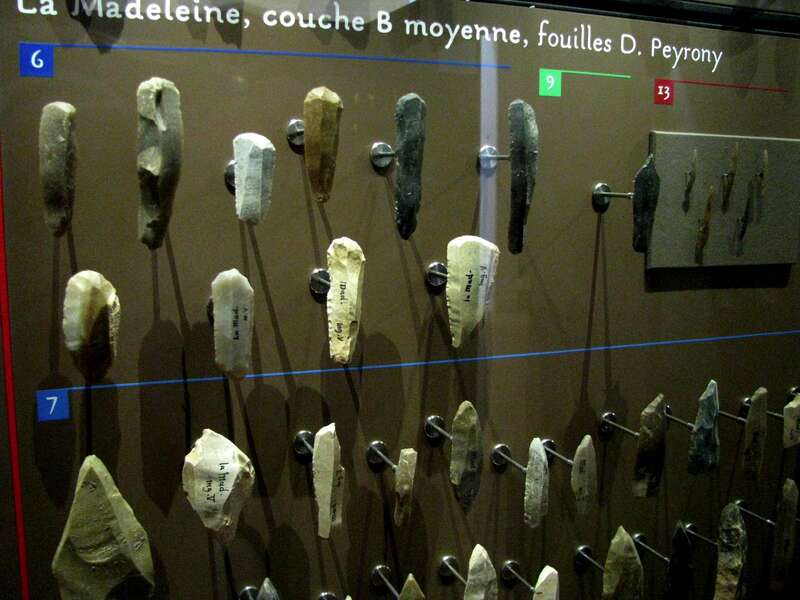 Unfortunately, Peyrony did not give more precise information on the nature and location of these objects. Their representation in the drawing that illustrates the burial site of the monograph is too schematic to identify them and do not reveal morphological differences sufficient to identify each category of objects and identify their location on the skeleton. 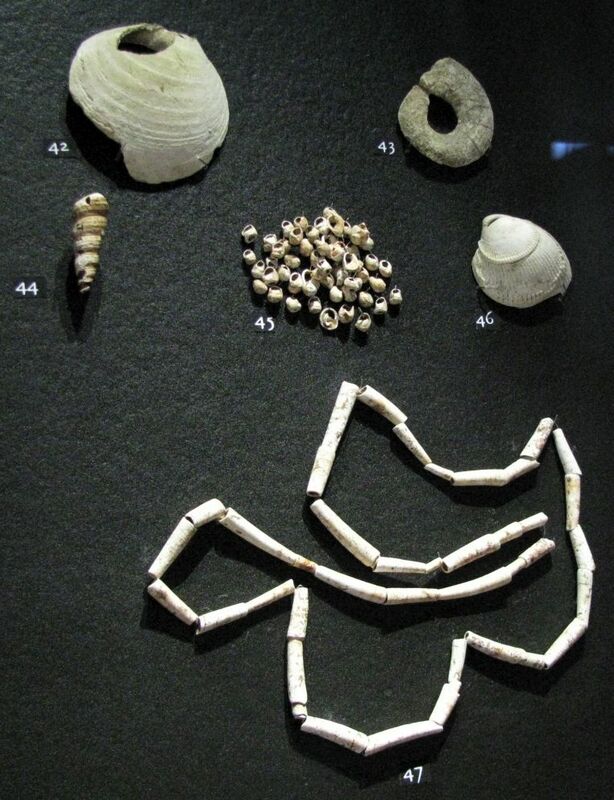 In its inventory of shell ornaments associated with this burial Taborin (1993) mentions 900 Dentalium, 160 Neritina, 20 Cyclope and 36 Turritella shells. 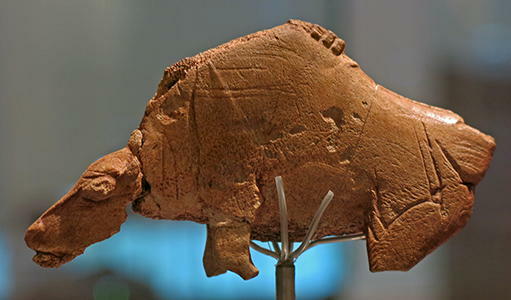 The attribution of this tomb in Magdalenian IV, given by Capitan and Peyrony and accepted by most authors, has recently been contradicted by the direct dating by AMS 14C of a fragment of the skull of the child which gave an age of 10,190 ± 100 BP (95,457 GIFA) or 9990-10390 cal BP, which assigns the child to the Azilian period. 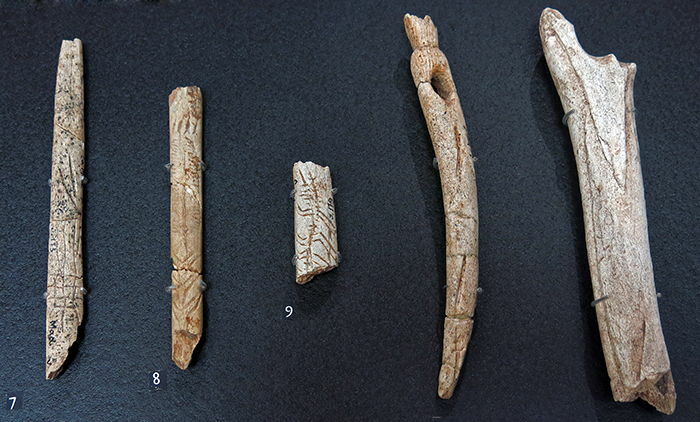 Ornaments found in a box labelled "Magdalenian IV" but probably belonging to the La Madeleine child. It seems likely that the Dentalium shells used for parure on the Madeleine child were collected from beaches. 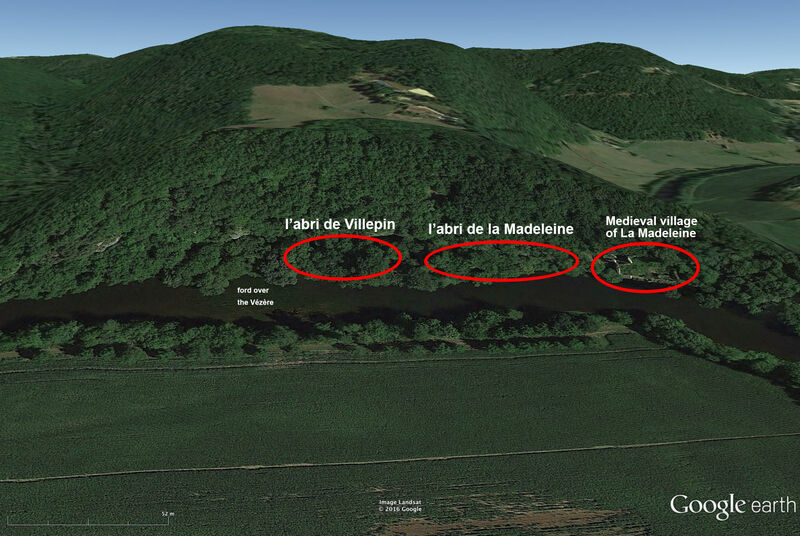 Shown on the map are the location of the La Madeleine site and Miocene fossil outcrops from Saucats-La Brède. 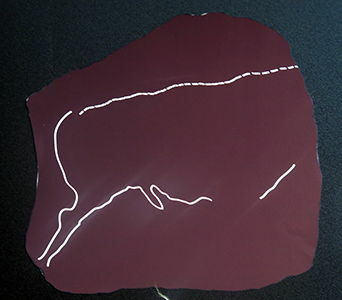 Coastline at 10 ka BP is indicated by a solid line, present day coast by an interrupted line. Bottom: Geological map with the location of the La Madeleine site (white dot). 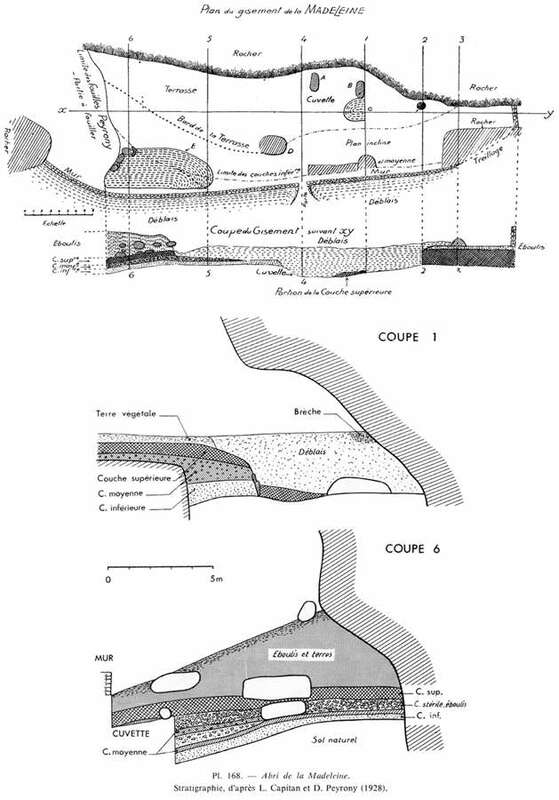 C3EZ: Middle–Upper Coniacian, C4BS: Lower Santonian, C4MZ: Middle Santonian, A, E, C, FC, FX: Quaternary formations. 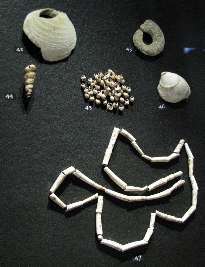 While the identification of the source of shells used as personal ornaments is crucial for determining home range and exchange networks of prehistoric hunter-gatherers, it is often difficult to identify the coastal versus fossil origin of the shells as most genera used as beads were available both at beaches and fossil outcrops. 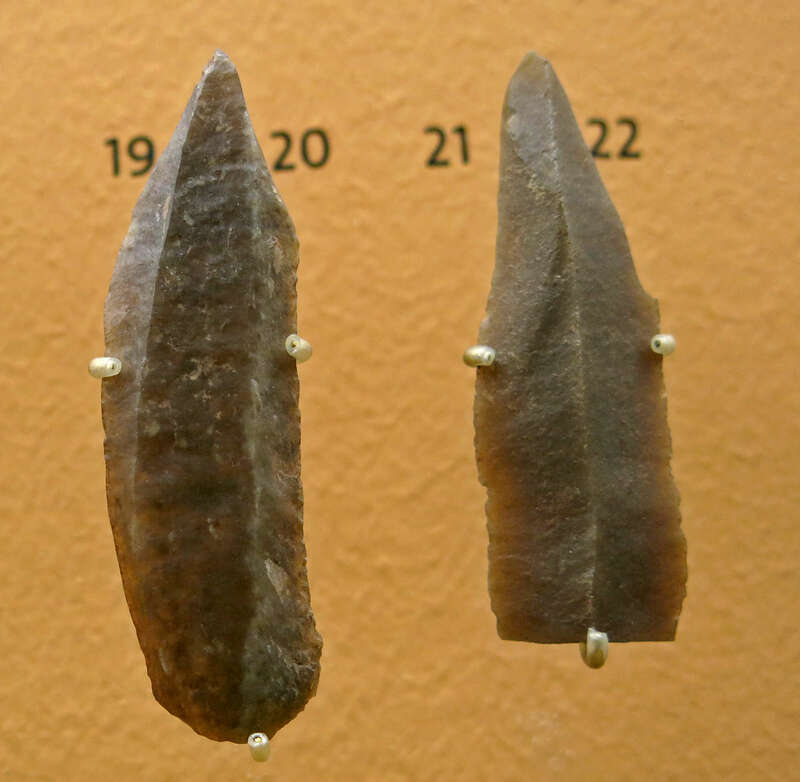 Here we present the first application of 87Sr / 86Sr isotope dating to identify the origin of Upper Palaeolithic shell beads. 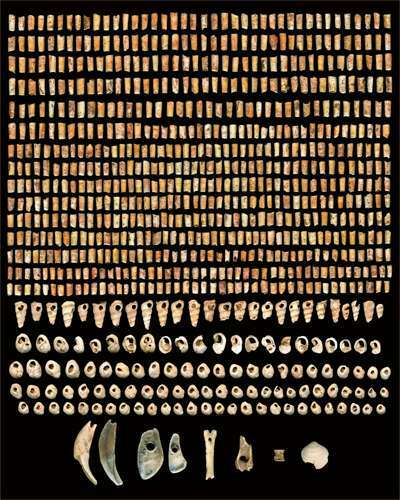 We analysed four out of a collection of one thousand Dentalium shells associated to the La Madeleine child burial dated to and one Dentalium from the occupation layers of this site. 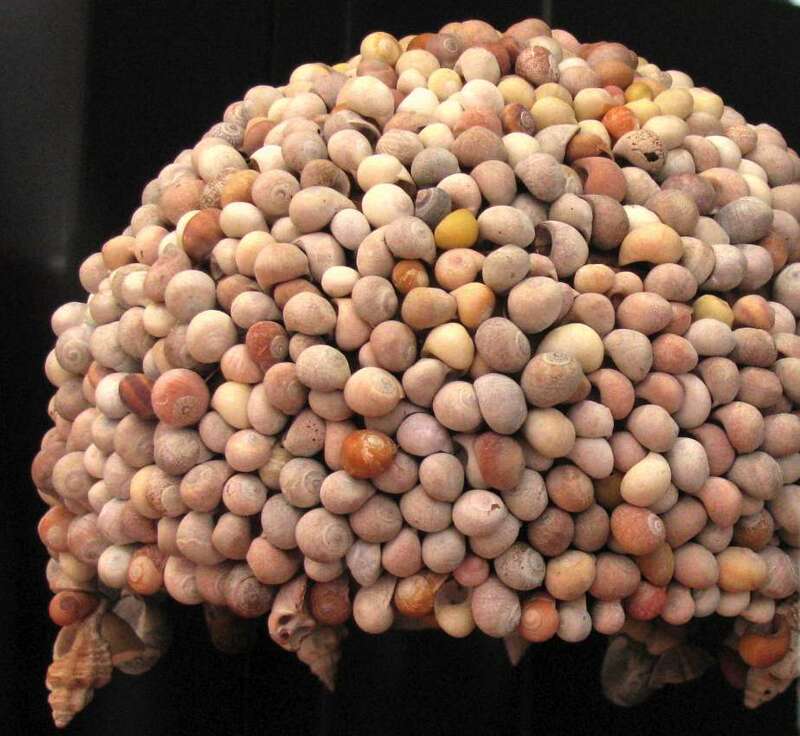 87Sr / 86Sr ratios indicate that shells were collected by Late Upper Palaeolithic beadworkers on far away beaches rather than at nearer Miocene outcrops. 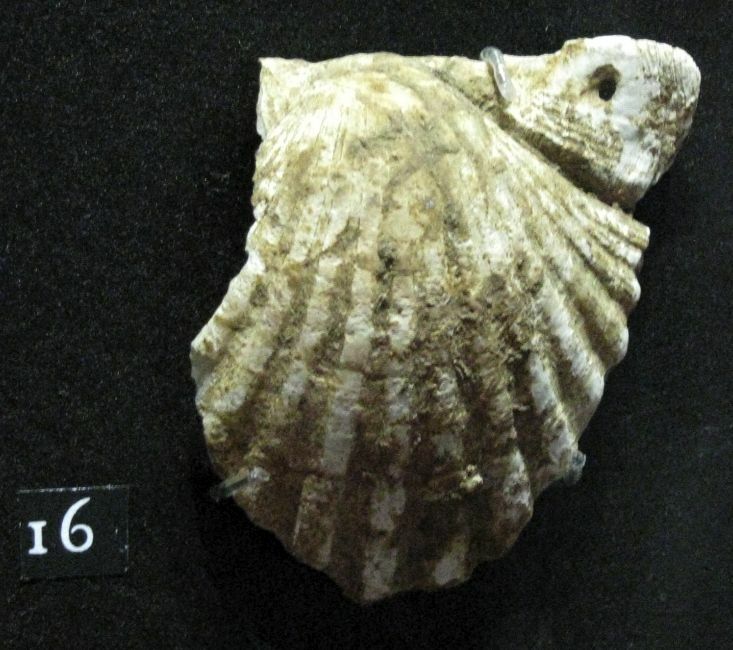 This may be due to the narrowness of Miocene Dentalium shells, incompatible with the size of bone needles used to sew these shell beads on clothes. La sépulture de Saint-Germain-La-Rivière, Magdalénien moyen. Découverte en 1934 par R. Blanchard, La sépulture de Saint-Germain-La-Riviere abritait le squelette complètement enduit d'ocre d'une femme d'une trentaine d'années richement parée. Les parois de la fosse étaient étayées par des dalles formant caisson, lui-même recouvert de deux grosses pierres plates constituant le couvercle. 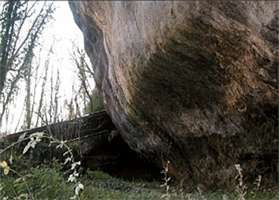 Il semble que cette structure de 'dolmen' abusivement admise pendant longtemps, ait été créée de toute pièce par les conditions particulières dans lesquelles s'est effectuée la fouille. La présentation proposée aujourd'hui parait beaucoup plus fiable. 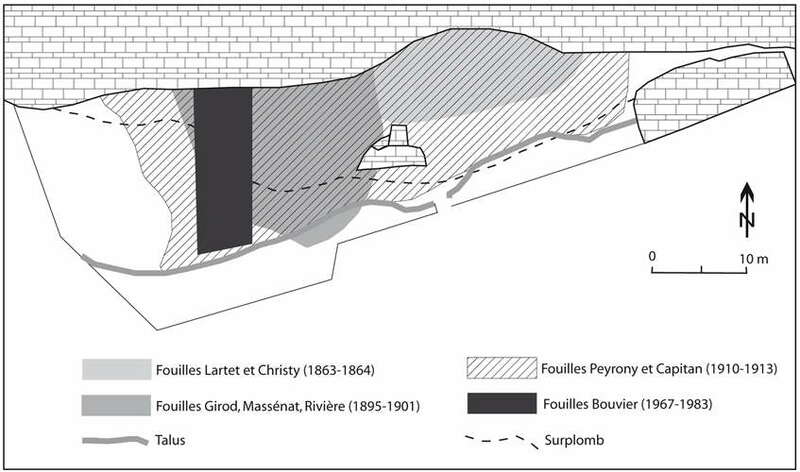 La position latérale fortement fléchie semble caractéristique de l'époque et se différencie nettement des inhumations postérieures (voir, à proximité, les sépultures de la Madeleine ou du Roc-de-Cave). 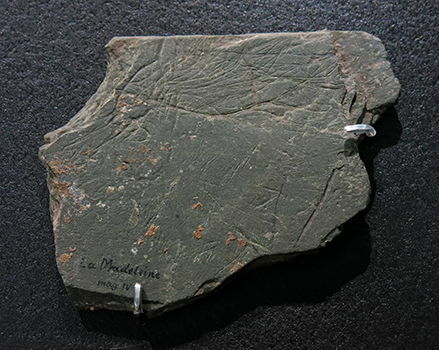 Le squelette a tout récemment été daté de 15 780 ± 200 BP, comme d'autres fossiles humains de la région, contemporains du Magdalénien moyen (Chancelade et Laugerie-Basse IV par exemple). 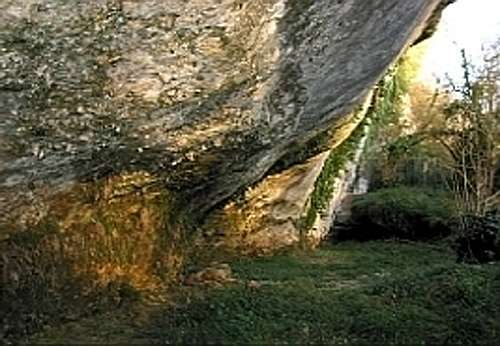 The burial at Saint-Germain-la-Rivière, Middle Magdalenian. Discovered in 1934 by R. Blanchard, the grave at Saint-Germain-la-Riviere contained a skeleton completely coated with ochre, of a richly adorned woman, about thirty years of age. 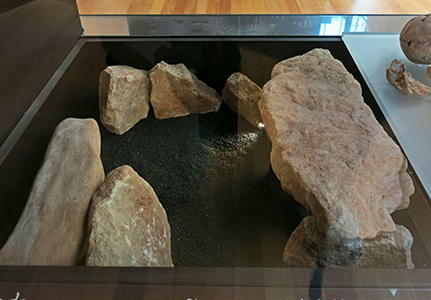 It had been reported that the walls of the pit were supported by slabs forming a box, itself covered with two large flat stones forming the cover. It seems that this 'dolmen' structure was wrongfully accepted for a long time, but it is now believed that the structure had been falsely understood by the particular conditions under which the excavations were performed at that time. The presentation proposed today seems much more reliable. 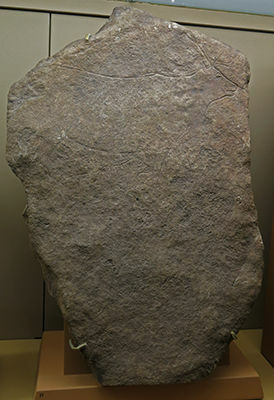 (see the way the position of the stones is now interpreted, left - Don ). 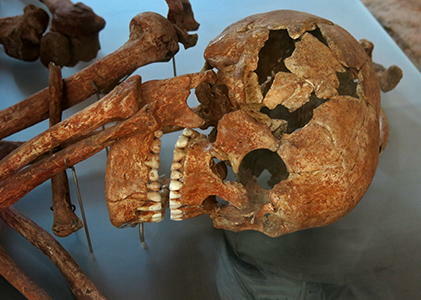 The highly flexed lateral position seems characteristic of the time and is clearly distinguishable from subsequent burials (see, nearby, the graves of la Madeleine or the Roc de Cave). 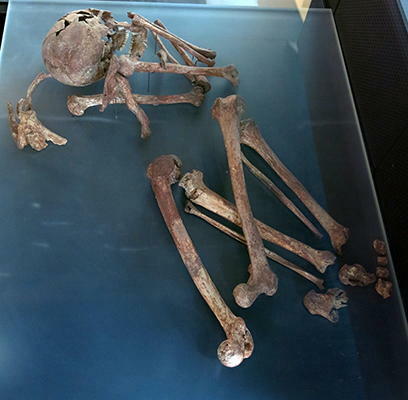 The skeleton has recently been dated to 15 780 ± 200 BP, like other human fossils in the region, in the contemporary Middle Magdalenian (Chancelade and Laugerie Basse IV for example). 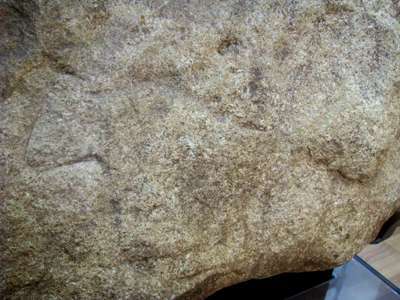 Human profile engraved on a pebble from la Madeleine. Cyclope neritea, one of the cyclope shells, from Spain, San Carlos de la Rapita. On sand, 20 cm deep. June 2001. This is probably not the same species as was used for the La Madeleine parure, but gives some idea of the genus. There are many species of Turritella, and those in the parure were not identified to species, but one of the most common in Europe is Turritella communis, a species of medium-sized sea snails with an operculum, marine gastropod mollusks in the family Turritellidae. 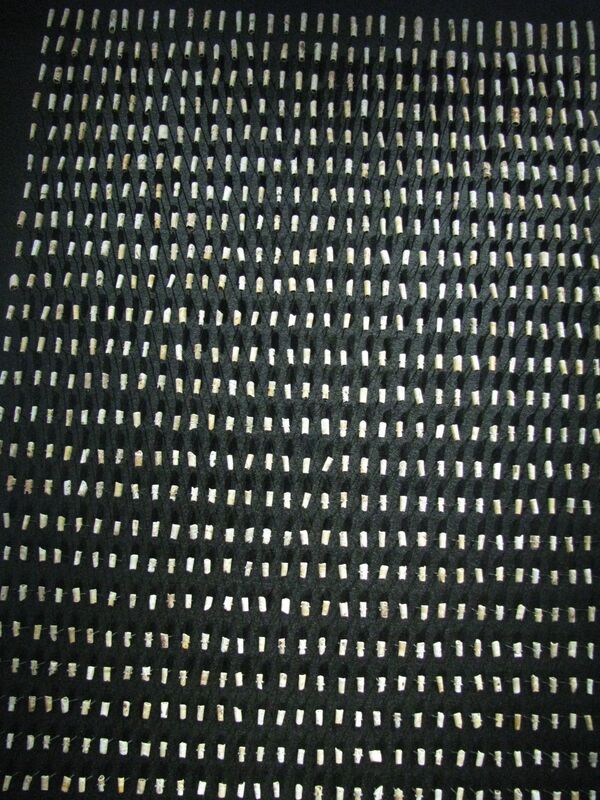 Deer teeth and cowrie shells from one of the burials at La Madeleine. La réalisation de ces pièces contemporaines s'est appuyée sur l'étude d'éléments de parures paléolithique. 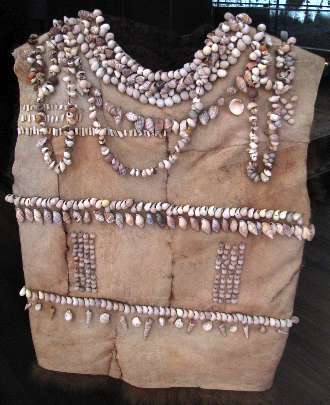 This beautiful recreation was based on study of the elements of Paleolithic decorated clothing. Several views of a single deer canine, drilled for a necklace. 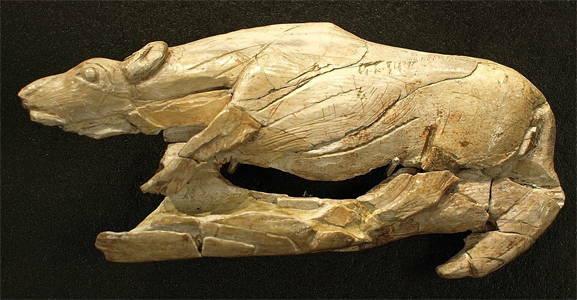 Photo of a human figure, snake and horse heads on a bone from La Madeleine, indicating two arced leaves on a branch. Note the depth of the engraved notational marks at the left. This is Marshack's drawing of the piece above. This is Breuil's drawing of the piece above. 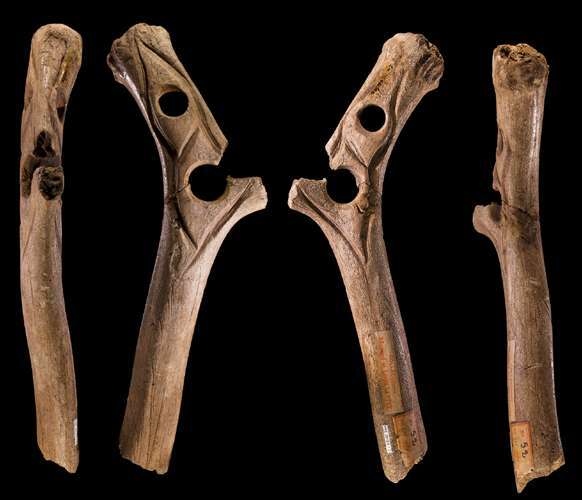 Note that, as Marshack points out, the twig the man is carrying has leaves which arc in an opposite direction to the one on the object, and also that the mouth and eye drawn by Breuil are not really there, but only seem to be there because of breaks and marks on the bone. 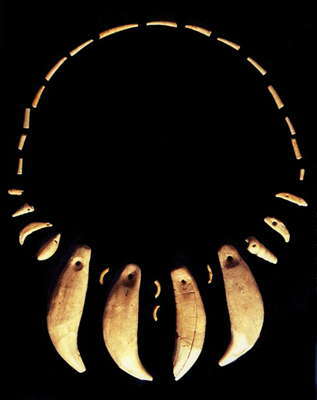 A necklace from Abri du Rocher de la Peine, near Les Eyzies. It is Magdalenian in age, and consists of three cave bear teeth and one lion tooth, together with other drilled teeth and shells, including fossil Dentalium shells. These objects were purchased in 1925 from Jean Esclafer, a local miller who had excavated the site, and from whom the Logan Museum leased the site for further exploration. 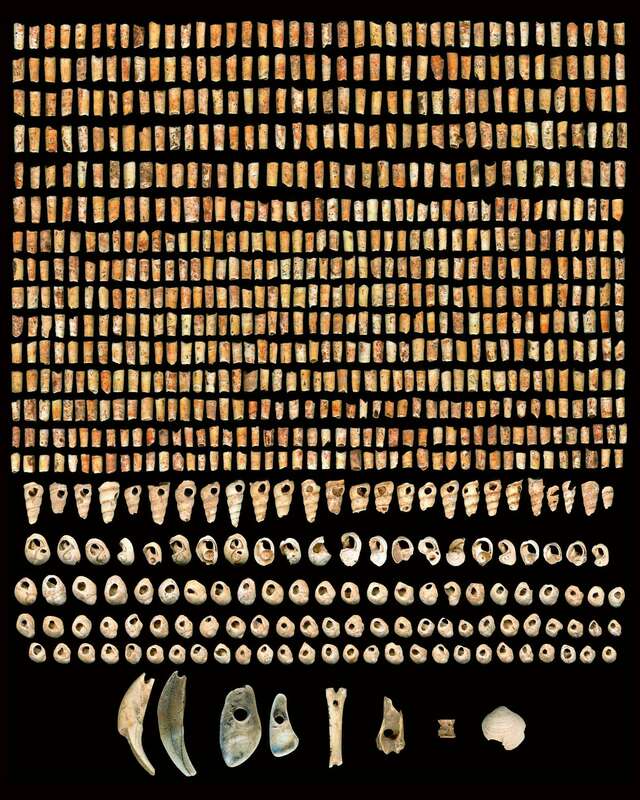 Three of the large teeth are bear canines, the fourth is from a lion (second from the right). A number of smaller teeth are also present: a wolf incisor, a deer canine and incisor, and a fox canine. 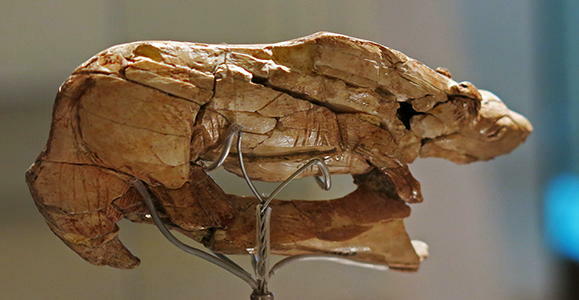 A detail of the lion canine reveals a series of incisions along all sides of the tooth. The tooth has been flattened and drilled for use as a pendant in a necklace. 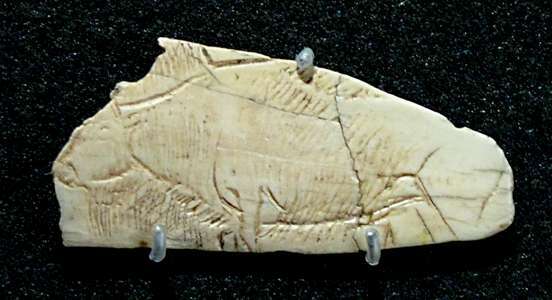 The incisions may indicate that this was considered a valued piece, perhaps because it came from a lion rather than from the more common bear. Necklace detail from Rocher de la Peine. 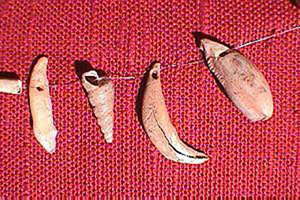 A variety of other teeth and shell form the remainder of the pendants. 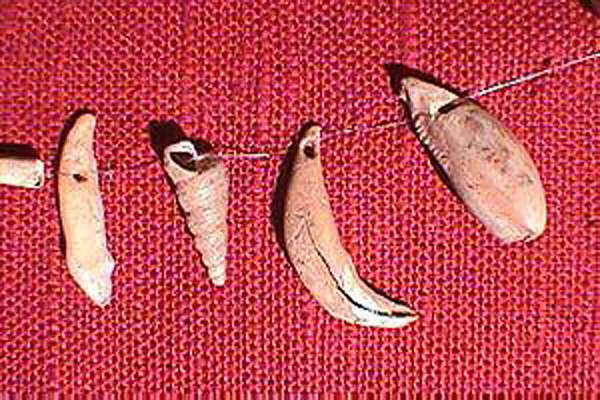 Here we have, (from the top), a red deer incisor, turritella shell, fox canine and cowrie shell. Such variety indicates the relative rarity of the various pieces, as well as a degree of artistic sensibility. 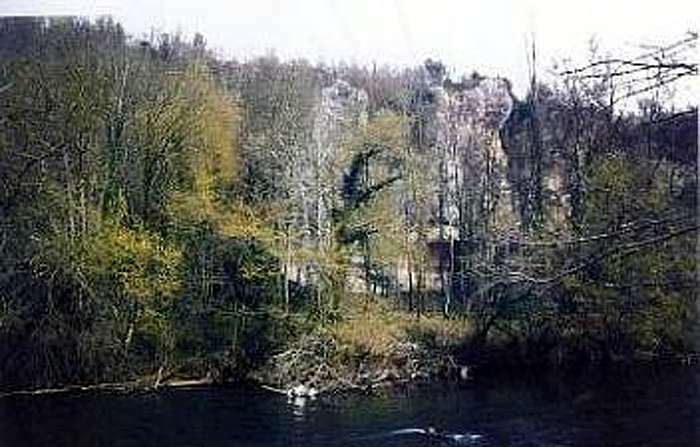 The site at the Abri Rocher de la Peine was excavated in 1926 by George Collie and Alonzo Pond, and has been referred to as the "Logan Museum site". 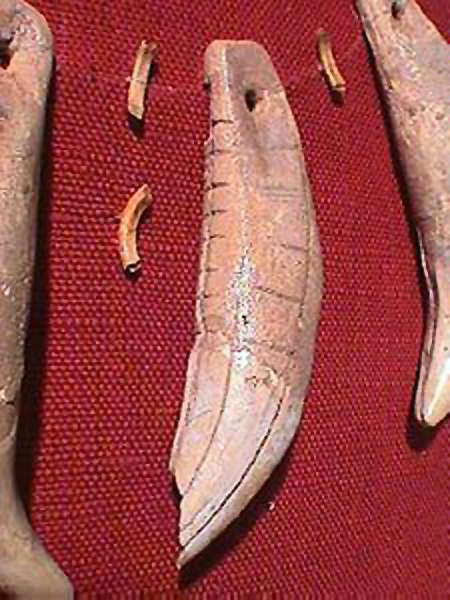 The site yielded a large number of ivory objects. An early postcard of the Abri Rocher de la Peine. 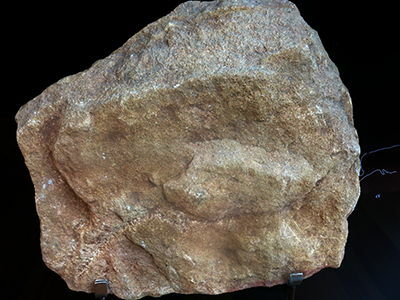 Abri Rocher de la Peine, 2007. These stunning pieces of art were used as propulseurs. A bison licking its shoulder on the left, a hyena in the centre, and what I think of as the 'sad' bison on the far right. 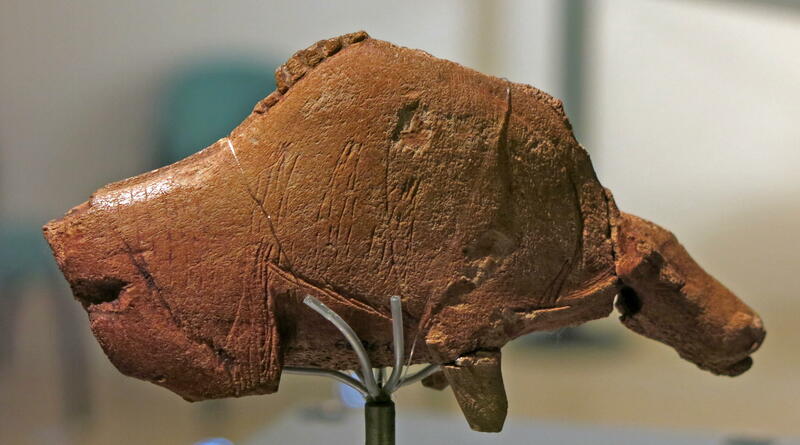 Close up of the head and forequarters of the bison. Bison, shown from the rear of the sculpture. Bison sculpture from the front, showing left and right sides. This is the front of the hyena propulseur. 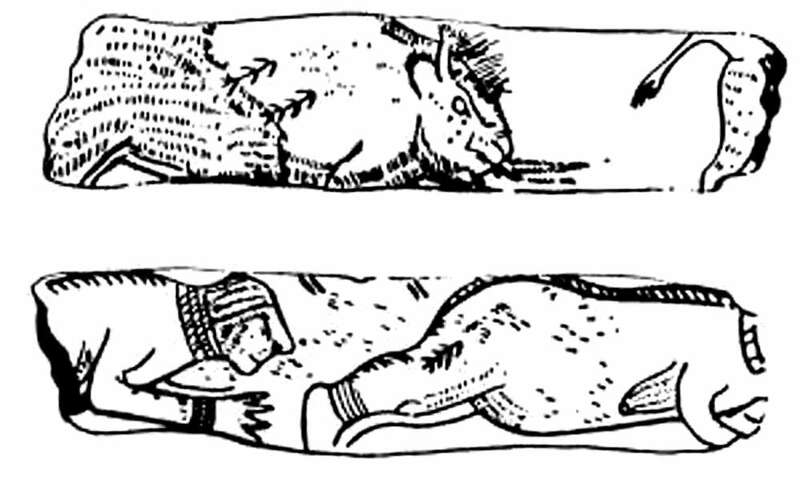 The artist has included the ground surface on which the hyena is sneaking up on its prey. This is like a scene in nature, a superb piece of work. This is the rarely photographed back of the hyena propulseur, showing clearly the many pieces that the propulseur was found in, as well as a good view of the hook used to propel the dart. This is a large version of this very important work, and I am grateful to the uploader of the image. I have flipped it horizontally to agree with reality. Wikipedia text: Part of a spear thrower made ​​of reindeer antler, found in the Abri La Madeleine (Tursac in the Dordogne, France). Exhibit of the National Prehistoric Museum in Eyzies-de-Tayac. (note that this photo seems to have been slightly stretched longitudinally compared with all the photos I have taken. 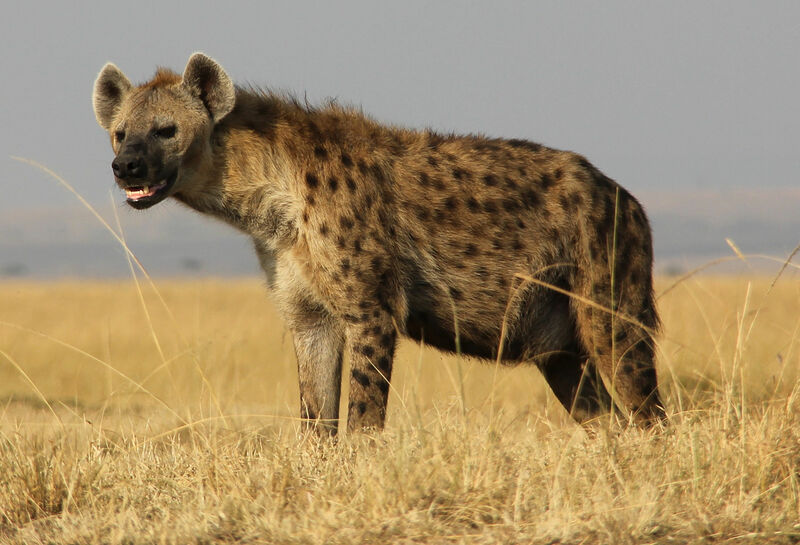 African hyena, photographed in Kenya. Note the characteristic long muscular neck, short hind legs, and prominent ears. These are labelled as ciseaux, or chisels. The term is somewhat enigmatic, and I have been unable to find a sensible use, or even a reliable definition, for items of this type. 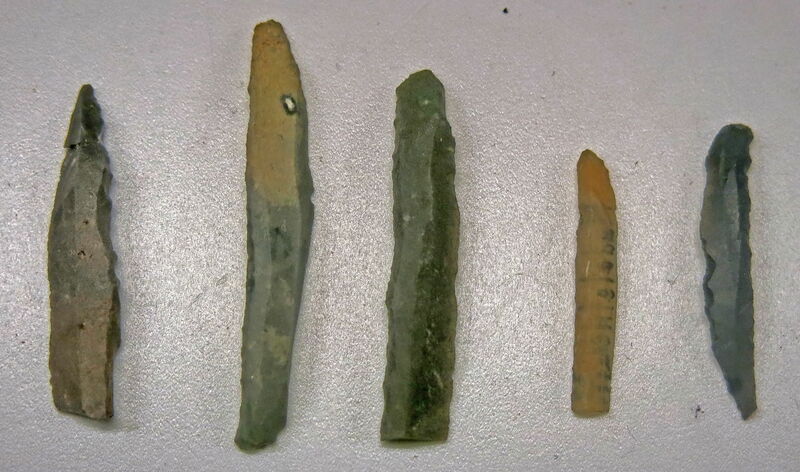 The ones shown here are basically cylindrical, with one end narrower than the other, and somewhat sharpened. Number 19 is labelled as a double bevel chisel. 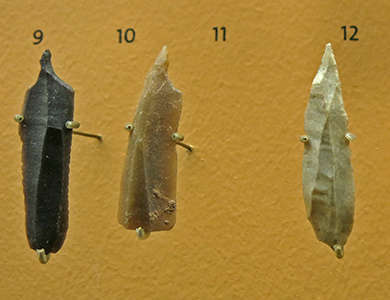 Many are flat, like modern chisels, but without handles. 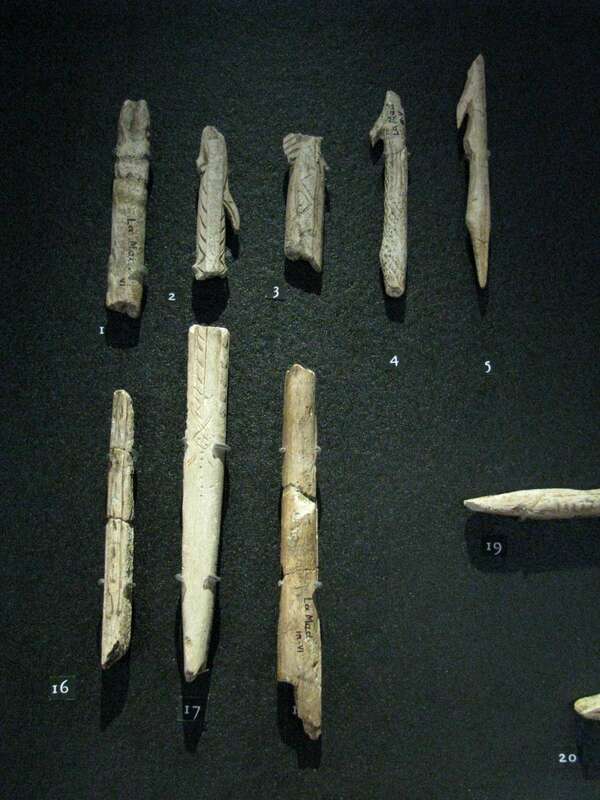 Being of bone or antler, they could have been used (for purposes suitable for what we now think of chisels) on only the most delicate of tasks, perhaps breaking apart bones previously weakened by a burin to form shapes suitable for bone spear points, for example. Left to right: Three baguettes demi-ronde, and two batons percé. 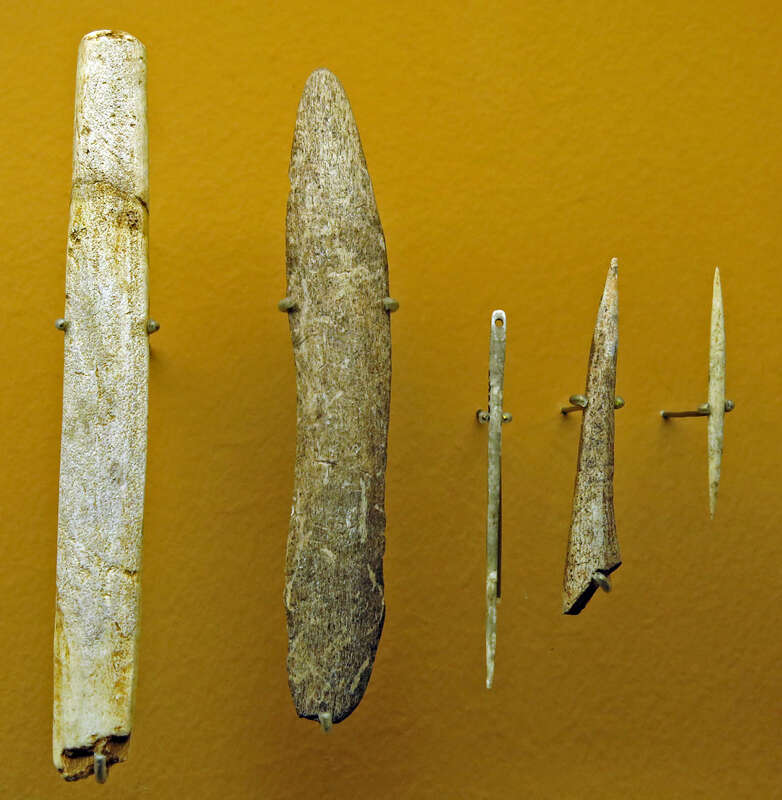 The baguettes demi-ronde are half cylinders which were wrapped around a flint point forming the end of an ivory or antler or bone spear head, depending on the material of which they were made. They were then attached to a spear/dart shaft, and were treated as, to some extent, disposable, as opposed to the spear shaft which was not easy to replace, and required a great deal of work to create, as well as the raw material (long, thin saplings) being in short supply in many times of the palaeolithic. At this time, climatic conditions were harsh, and not conducive to the growth of such plants. 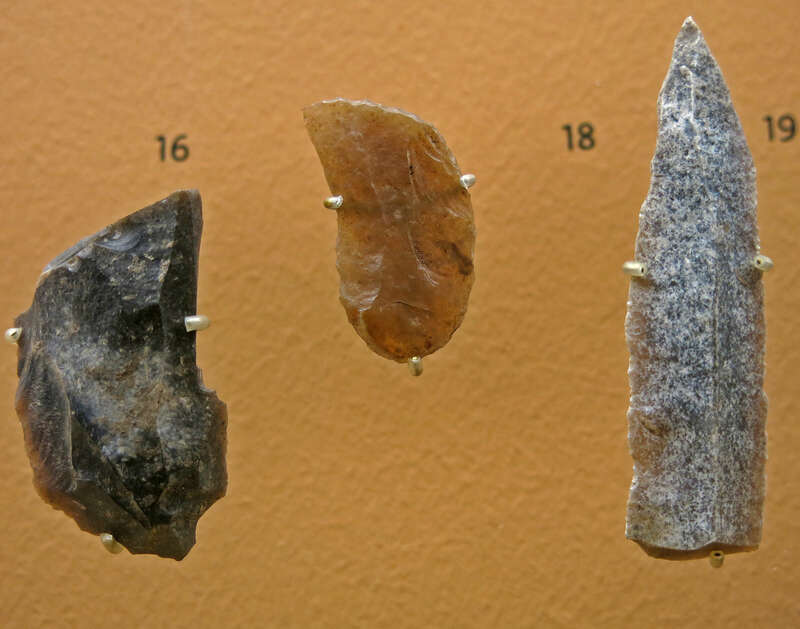 In addition, spear shafts/darts were long and awkward to lug around, and not many could be carried by a hunter at one time, whereas many prepared spear heads could be easily transported in a small leather bag, and swapped fairly easily as required. The spear heads were designed to come apart from the shafts once they had sunk into the prey, leaving the shafts to be collected undamaged, and reused. 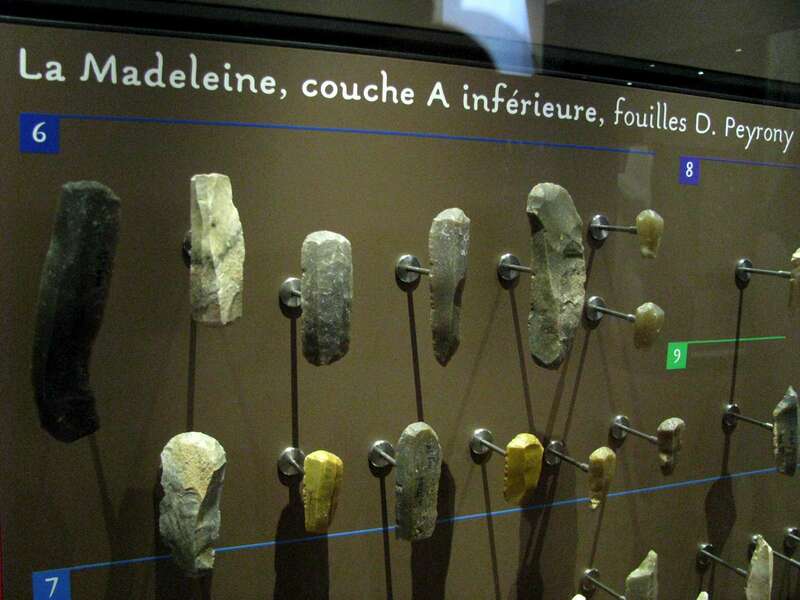 The baton percé second from the right calls into question the alleged purpose of these tools as spear straighteners. This small, delicate tool could never have served this purpose. Decorated diaphyse, the middle portion of a long bone, Middle Magdalenian. Engraving of a horse head on a diaphyse, the middle of a long bone, Middle Magdalenian. 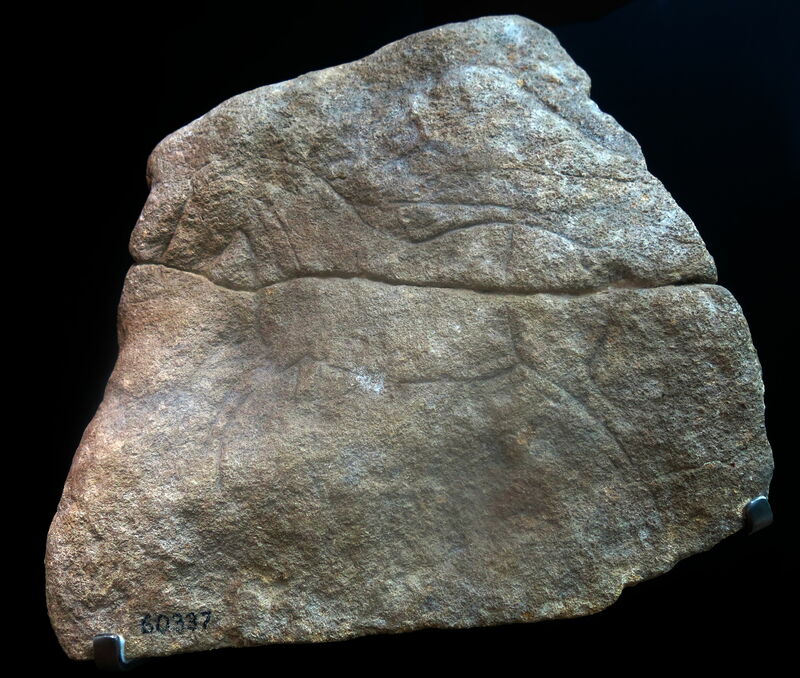 Engraving of a lion head on a sandstone plaque, Upper Magdalenian. 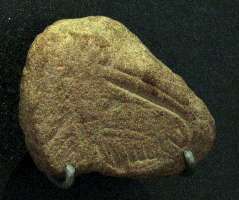 Pebble engraved with a pattern, Upper Magdalenian. Engraving of an ibex on a pebble, Upper Magdalenian. 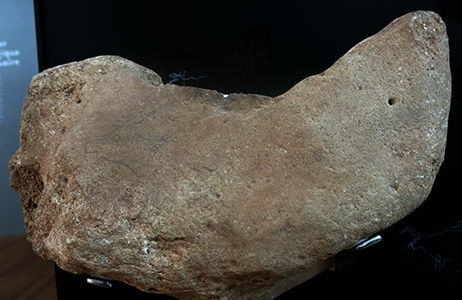 Engraved rib, used as a compressor in flint knapping, Middle Magdalenian. 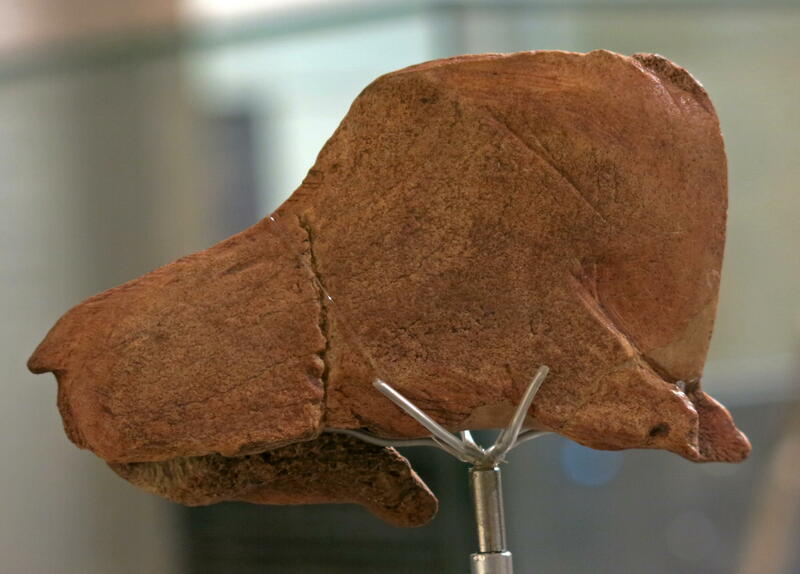 Engraved horse head on a diaphyse, the middle of a long bone, Middle Magdalenian. 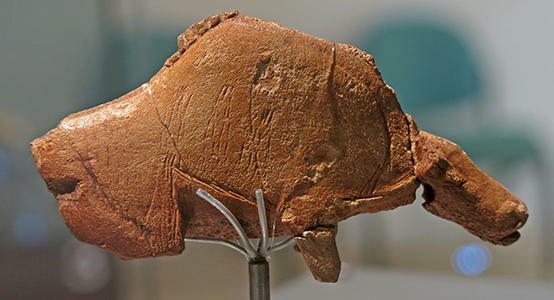 Engraved horse head on a rib, Middle Magdalenian. This is a quite rectilinear design, with even the eye shown as a rectangle. 42 Shaft, probably a propulseur, a spear thrower. 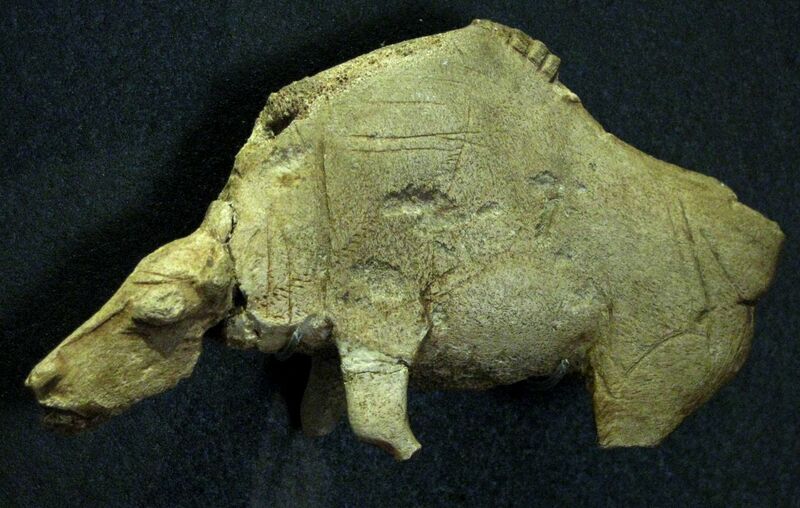 44 Probable propulseur, spear thrower. 45 Sculpted antler, probably a leg. (right) Lissoir, a polisher for preparing leather. Lamp carved in limestone, from la Madeleine. It would have had fat or oil in the depression, with a twist of moss or string for a wick. Male reindeer bellowing during the rutting season. 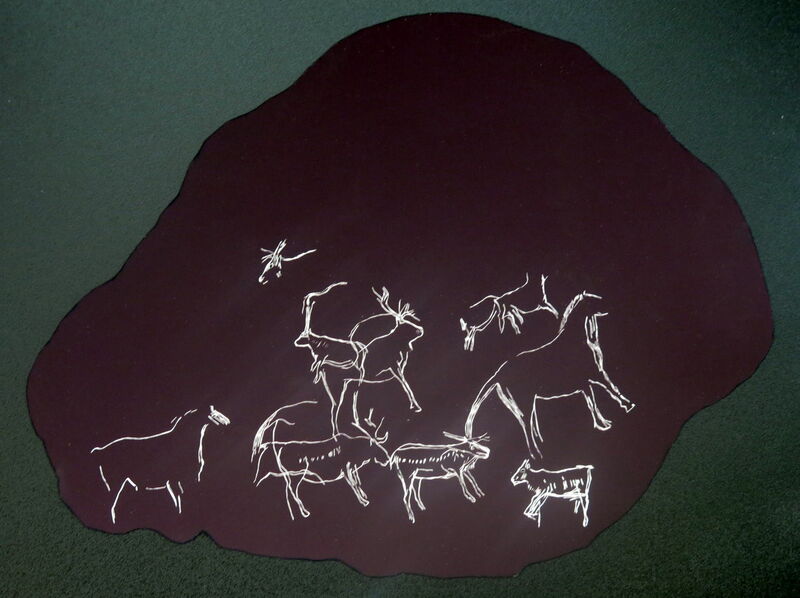 Reindeer, horses, other animals, and indeterminate lines. Head, neck, shoulders and chest of a reindeer. Aurochs and the hindquarters of a horse. Lynx, indeterminate signs and lines. Engraving of a reindeer on stone, Magdalenian. 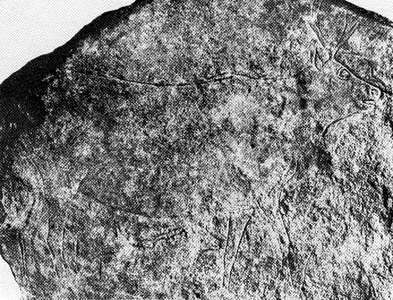 Engraving of an aurochs on stone, Magdalenian. 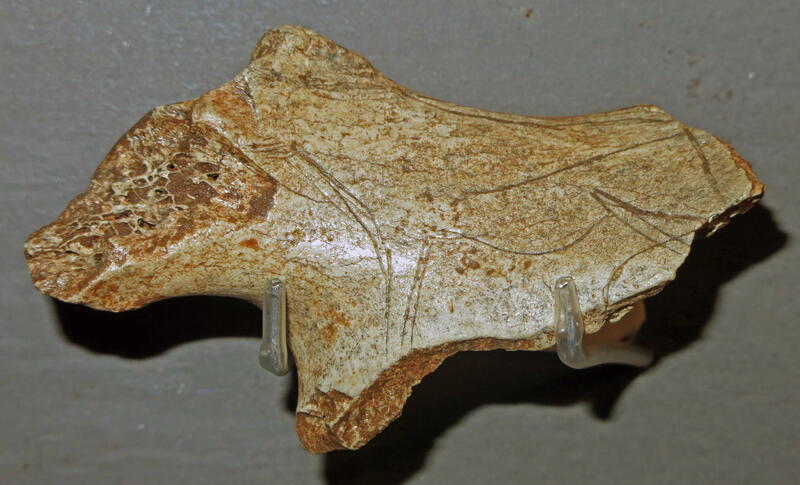 Ibex carved on a rib, from Grotte des Eyzies, Magdalenian. Bison carved on a lissoir, a polisher, from Arancou, Magdalenian. Bone pendant decorated with an engraved drawing of a wolverine, Late Magdalenian, around 12&nbp;500 years old. 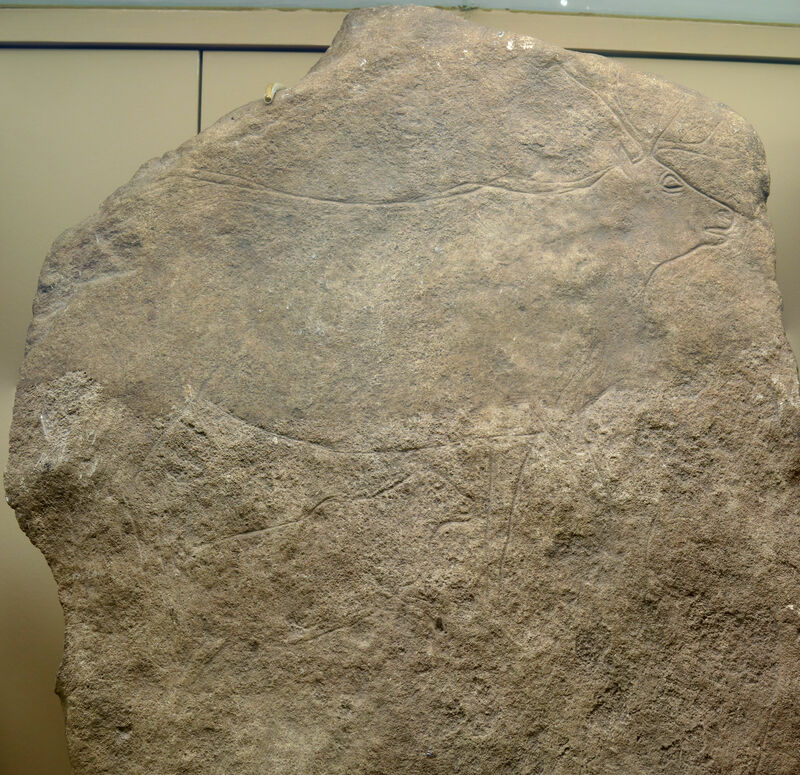 Two horses carved on a compresseur or spear thrower, from La Madeleine. 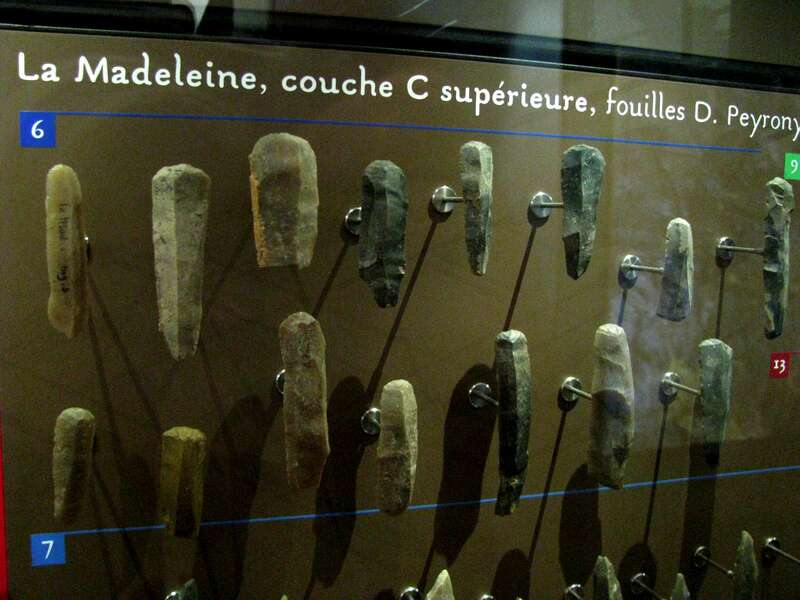 This piece was labelled "Ciseau - Magdalénien moyen" which translates literally as "Chisel - Middle Magdalenian". It is 131 mm long. It looked to me more like a rough draft for a venus figure, and Duhard (2009-2010) (see below) agree. 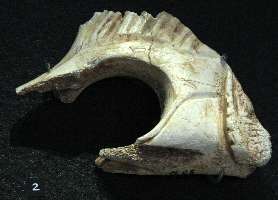 (left) Anterior side (cortical bone), 131 mm long. 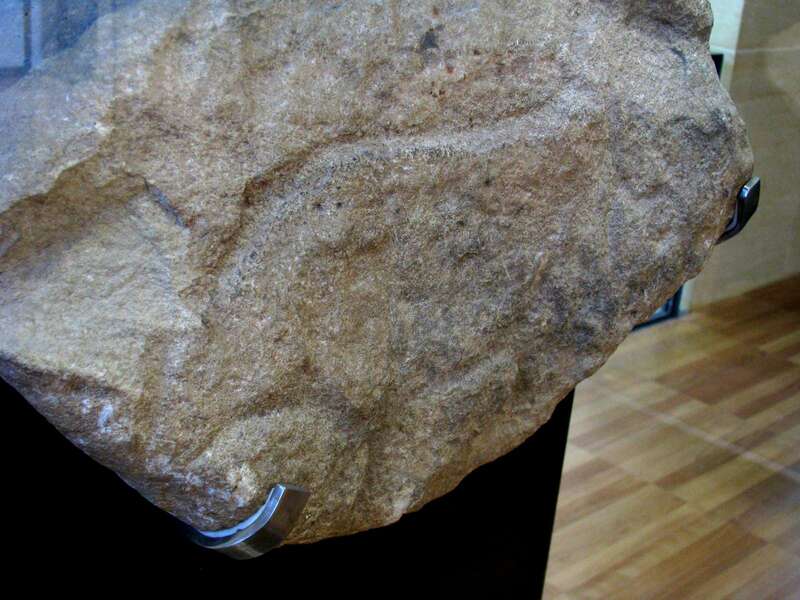 (right) Left lateral side with longitudinal groove. 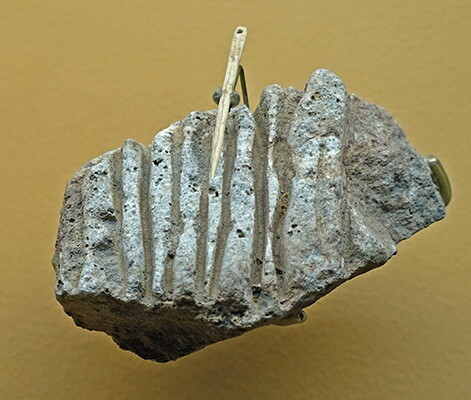 This object, elongated and with a semi-circular section, is shown in a case in Le Musée National de Préhistoire, Les Eyzies-de-Tayac, and labeled 'fragment of antler, chisel'. Its true nature did not escape N. Aujoulat who in his inventory of portable art of the MNP, has called it a 'probable anthropomorphic sculpture'. Rightly so, because it is actually a human, specifically a female figure carved and engraved, represented by the upper trunk to the beginning of the thighs. 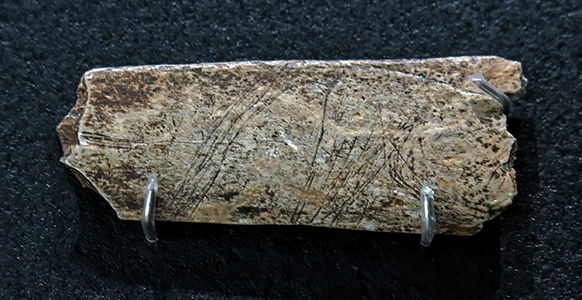 Coming from the Magdalenian IV, this is a segment of cortical reindeer antler, an elongated and round semi-section 131 mm long, 30 mm wide and 13 mm thick, cut from a reindeer antler, probably in the antler or antlers of the central stem. 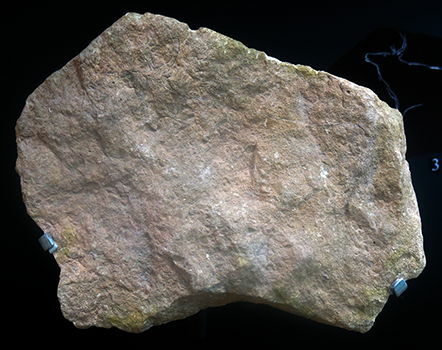 The object is unlikely to have been used as a dagger or chisel. 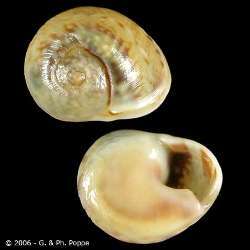 Nothing is less certain: it is small, appears fragile and has no sharp proximal or distal end. Detail of the pelvis, 30 mm wide. Another view of the same venus figure. Engraved spear straightener, with an unidentified animal engraved on the shaft. The spear straightener has had one hole broken out, and another inserted. It was obviously a favourite implement of the hunter who made it. 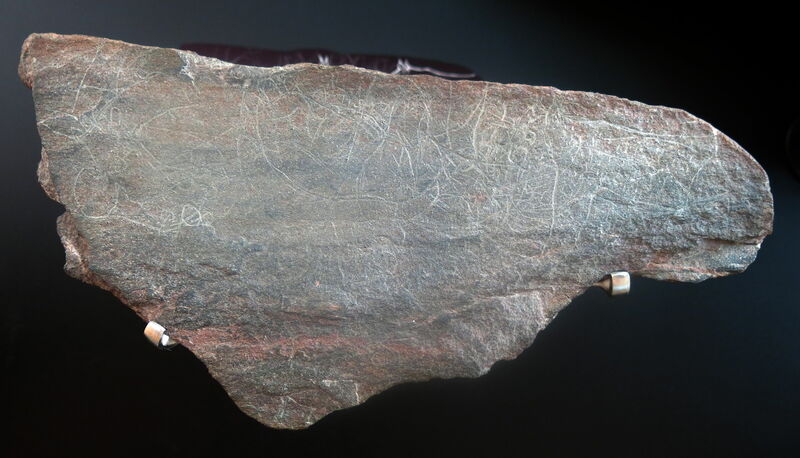 Engraved spear straightener, as above. 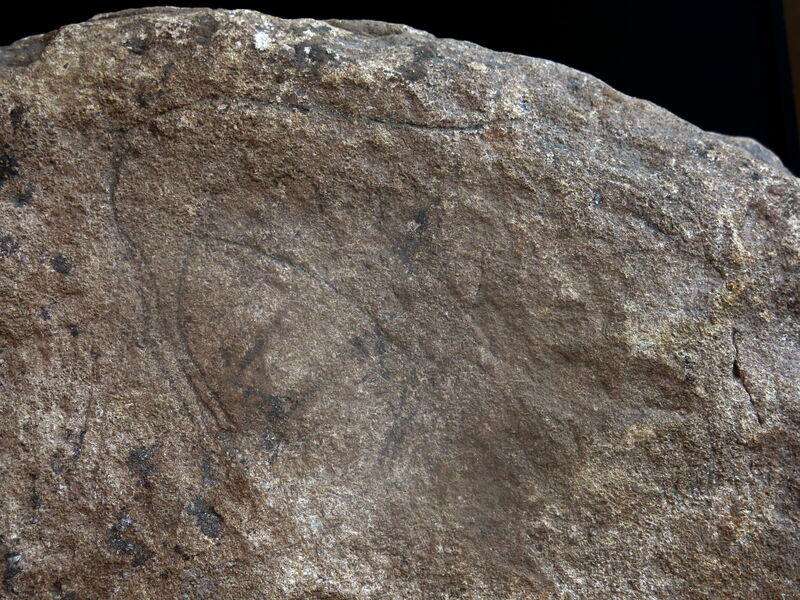 The animal engraved is not part of the standard repertoire of images. With its large eyes, small ears, whiskers and fur/hair at the throat, and a streamlined body, it looks like an aquatic mammal. As AnnDee points out, it is probably an otter. Otters are members of Mustelidae, the weasel family. They are highly inquisitive predators with voracious appetites and rapid metabolisms. 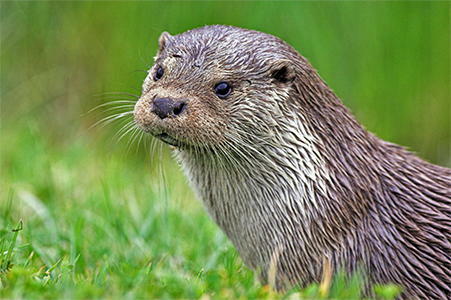 Otters differ from their land-dwelling cousins, weasels and ferrets, in a very important way: they are specially adapted for life in the water. The bodies of otters are generally long and slender, with flattened tails that they use like a rudder to steer through the water. They all have webbed hind feet and most have webbing on the front feet, making them very strong and agile swimmers. For the most part, otters divide their time between the land and the water. They are very opportunistic predators and they will occasionally take prey such as insects and small mammals while on land. However, otters do the bulk of their hunting underwater, coming ashore only to rest, mark their territories, or care for their young. The water in which otters feed is often very muddy or dark, making hunting by eyesight difficult at best. To cope with these conditions otters have stiff whiskers, called vibrissae, around their faces and on their elbows. The vibrissae help otters feel the vibrations caused by swimming prey, allowing them to track fish, frogs or crustaceans in water that is murky or deep. These waters may also be fairly cold, and (unlike marine mammals like seals and whales) otters do not have a layer of blubber to keep them warm. Instead, otters fluff their fur with their paws to trap air in their thick coats. The trapped air acts as insulation from the cold. This engraving on a rib bone shows a mammal's head, possibly an ibex, on the right. My thanks for interpretation of this piece to Andrea Castelli. Length 65 mm, width 15 to 18 mm, thickness 4 mm. 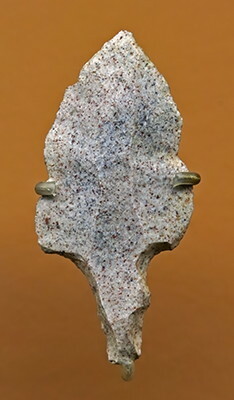 This carved spear point may represent a fish. This is a curious little piece with no obvious purpose, which looks almost like a tally of events or items. It appears to be mis-labelled, since it is clearly marked as coming from La Madeleine, but the label for it in the cabinet says it comes from Laugerie Basse. 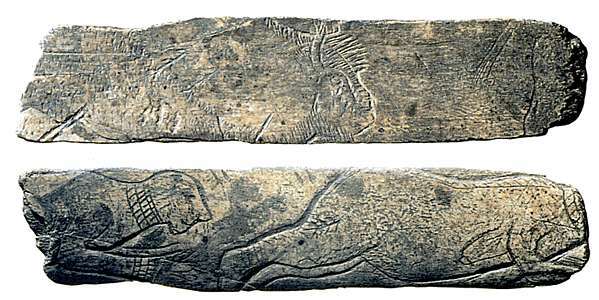 Spear straightener engraved with horses, side A. 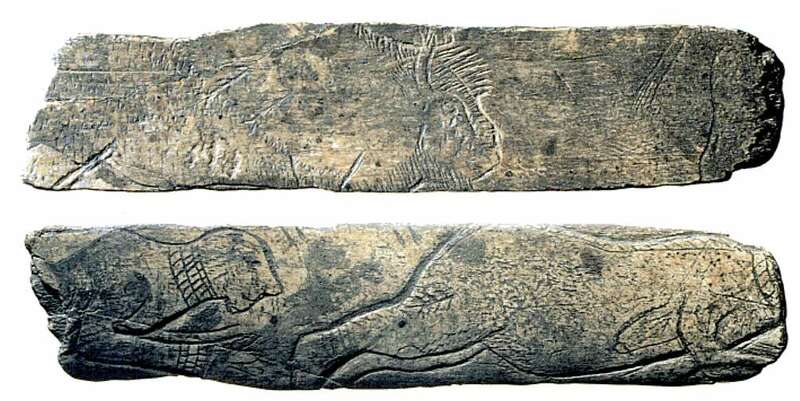 Spear straightener engraved with horses, side B. 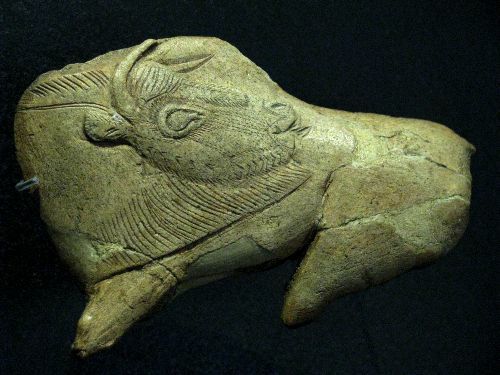 Note that the baton has been carved with the artistically stylised likenesses of two aurochs or bison, or one of each - but they have the characteristic 'beard' of a bison. This is a superbly decorated piece. 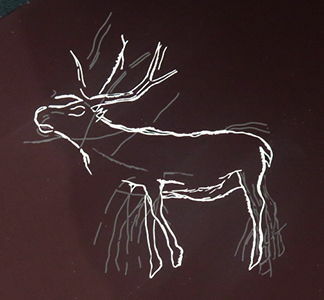 The horse head, facing to the right, has been shown with the effect of all over shading, which is accentuated by the smoothing of the reindeer antler outside the outline. 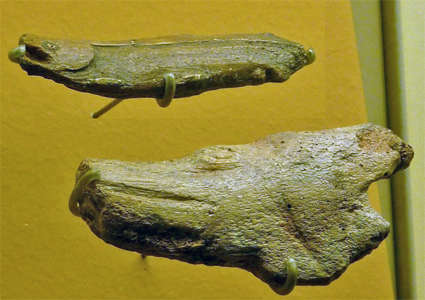 The heads of two horses have been carved into the baton, facing to the left. The jaw is accentuated on the leftmost, larger of the two, and the mouth, nostril, eye, ear, and mane are indicated. (Bâtons de commandement or bâtons percé or batons perforé or pierced batons are thought by some to have been spear straighteners, (which may be why they are often found broken at the hole). There are many other theories as to their use. However no one seriously thinks they were marks of rank within the community any more. 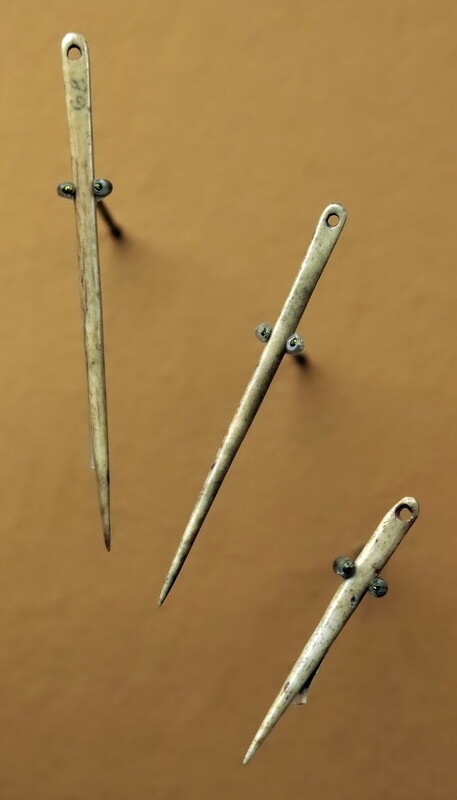 The spears used are more properly referred to as darts, they were not the strong thrusting spear as used by, say, the Romans, but a long, thin, whippy piece of wood. The ability to bend is an integral part of why they are able to be thrown such long distances. The bend stores up energy which is released in the form of extra speed as it leaves the spear thrower. 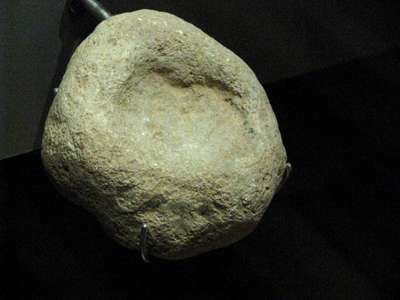 A horse, with muzzle, mouth, eye, jaw, forehead, mane, neck, and part of the chest, has been carved into this limestone pebble. 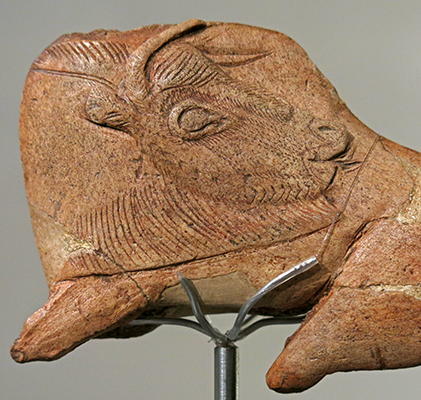 While a case can be made that art such as this was used as hunting magic on pierced batons, this would seem to be purely for artistic purposes, or perhaps practice. 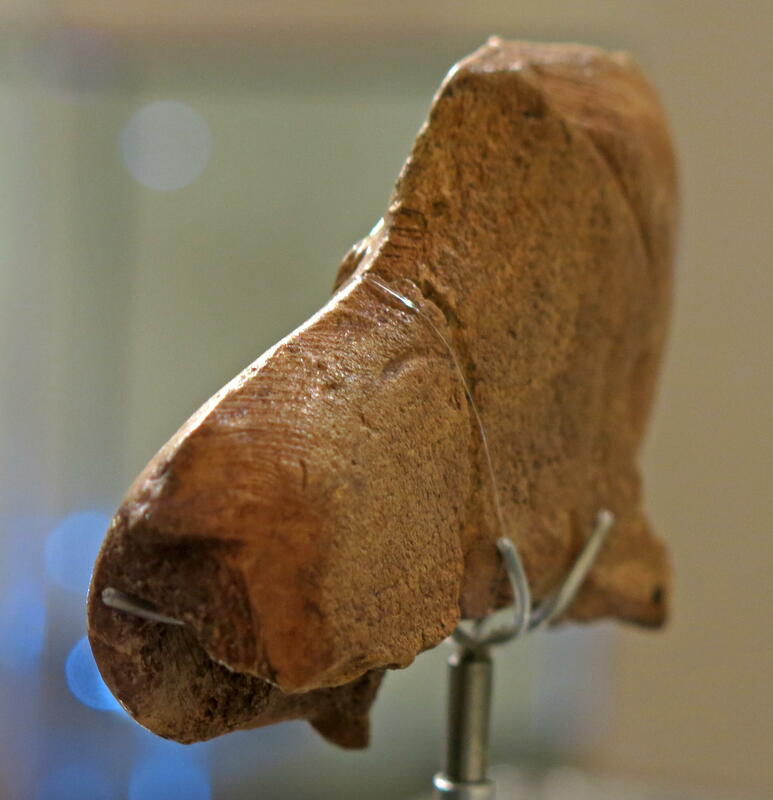 Phallus carved from reindeer antler - Upper Magdalenian, from la Madeleine. Phallus, as above, fortuitously showing the other side. 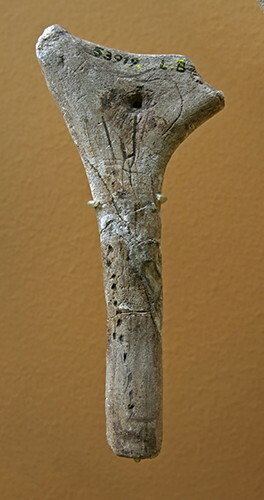 Carved in the round of reindeer antler, on loan from Les Eyzies-de-Tayac, musée national de Préhistoire. 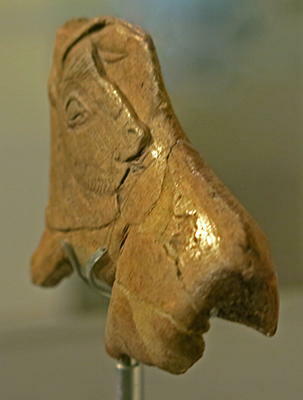 Right (13 - Reindeer antler sculpted into the shape of a horse's head. 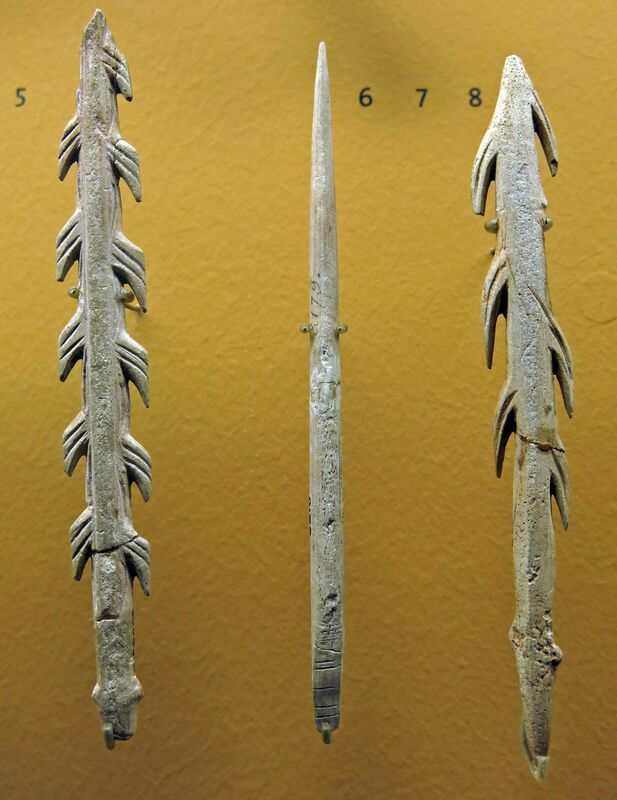 Harpoon and spikes from l'Abri de la Madeleine. Denis Peyrony is a giant of the field in this area. 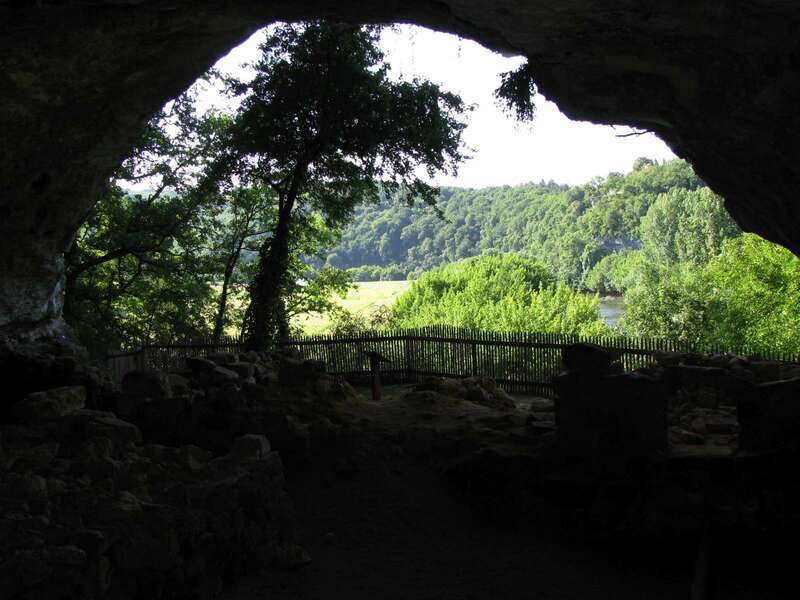 He made many important discoveries, and was indefatigable in his endeavours to find and recover for science evidence of the former inhabitants of the Dordogne. Backed blades from la Madeleine. 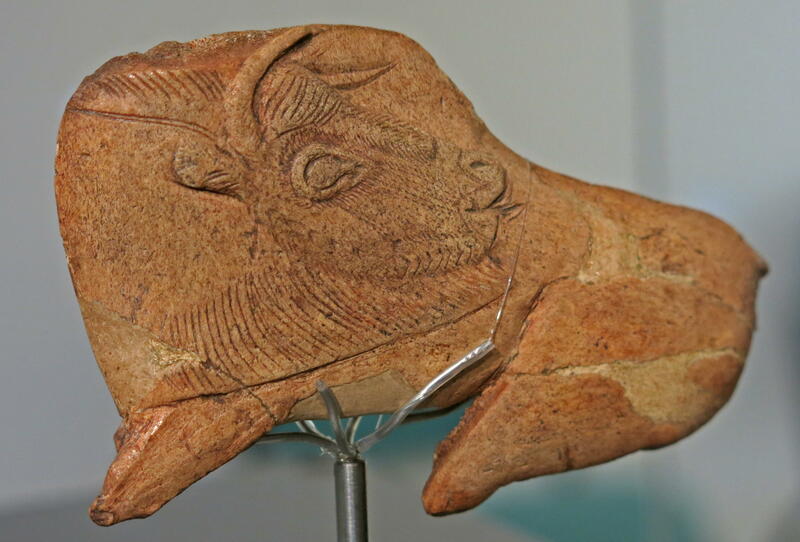 Carved plaque - Upper Magdalenian. The carvings include what appears to be a horse head, with a large eye, but there are many other lines on this plaque. Carved omoplate or shoulderblade - Middle Magdalenian. 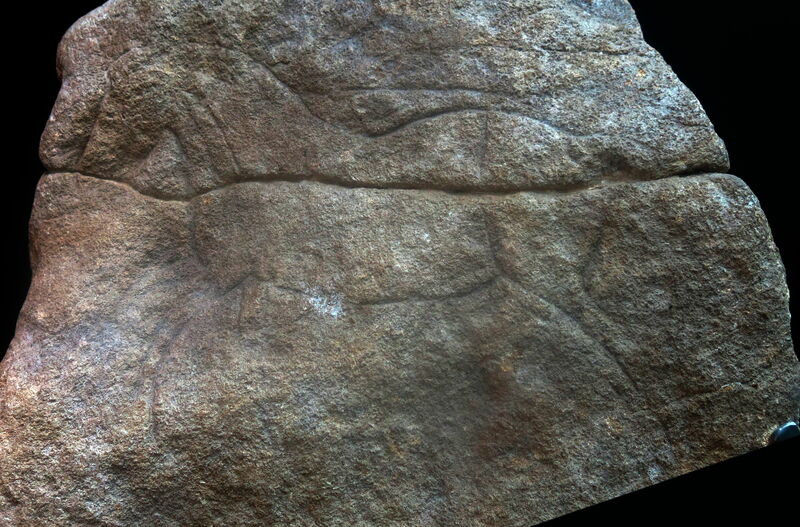 The carving shows the body of a horse, including parts of the tail, hindquarters, and forequarters. 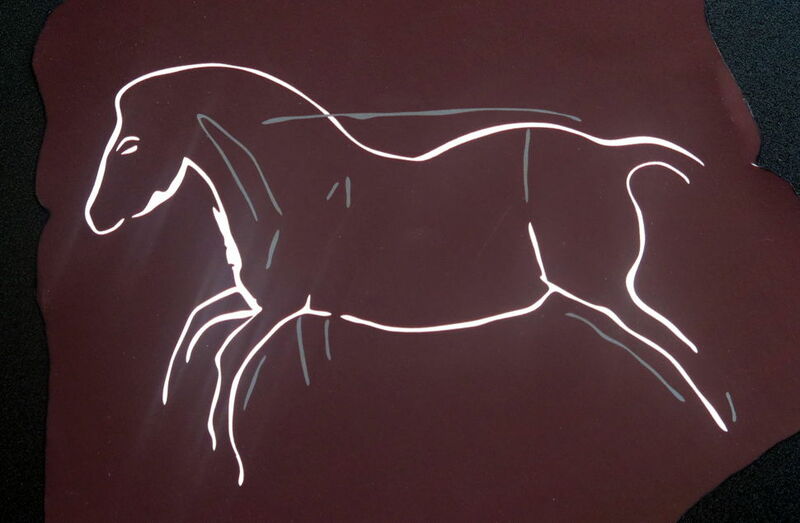 Also included is the line of the back, the neck, and what may be the muzzle, as well as the mane. Carved rib - Middle Magdalenian. The carving shows the hindquarters of a horse, with a long flowing tail, several attempts at a rear leg, as well as the abdomen and the rear part of the back. The forequarters and head are missing. 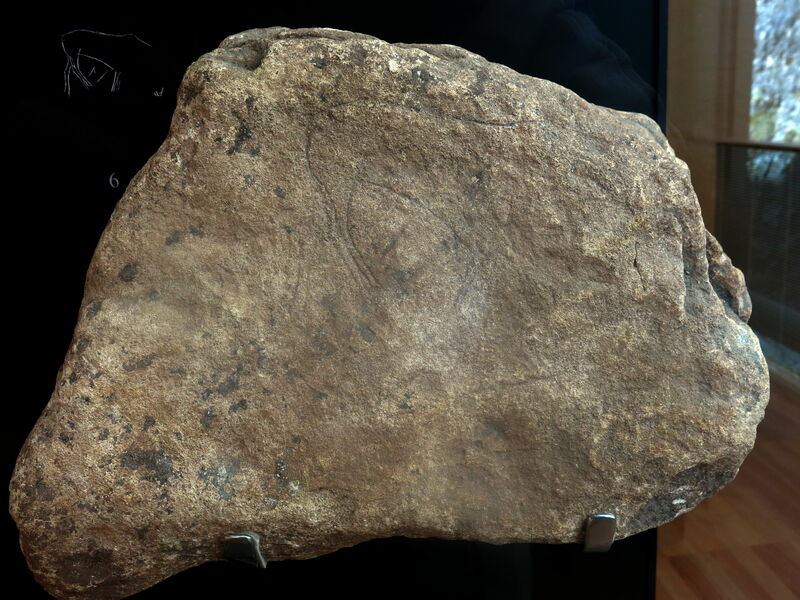 There is an engraving on the left of the ciseau showing the head of what may be a horse. 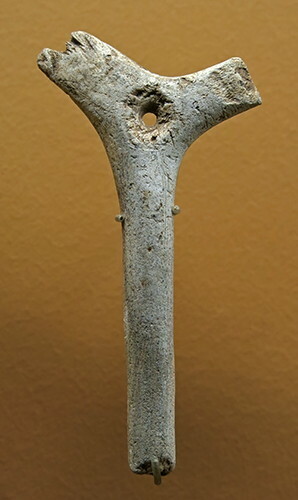 Engraved coxal bone, part of the pelvis of a herbivore, on loan from Les Eyzies-de-Tayac, musée national de Préhistoire. 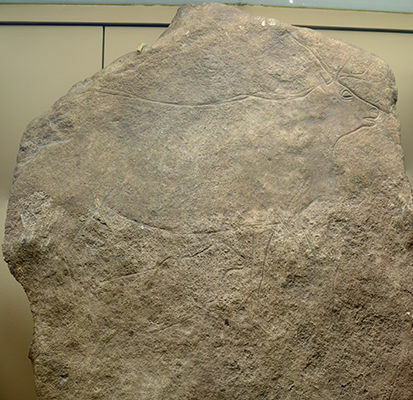 It has been decorated with a carving of what could be a reindeer or horse. This is a curious creature. It bears some resemblance to an otter. Only one rear limb is shown on the engraving. This image of two creatures is remarkably similar to the otter-like one above, but importantly, it is shown wearing neckbands, bracelets and anklets. 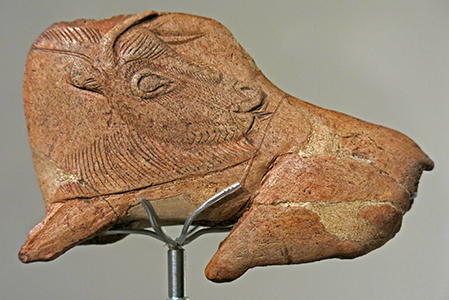 These creatures may be human, or figures from mythology, or even two images of an animal god of some kind. They may also represent a shaman dressed in shape-shifting clothes and mask. 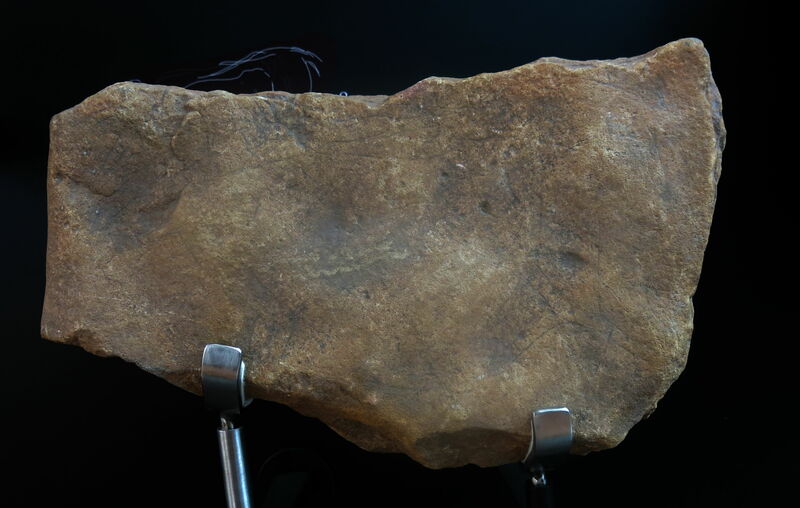 The creatures are marked with barbs and other symbols, but it is not certain what they represent. 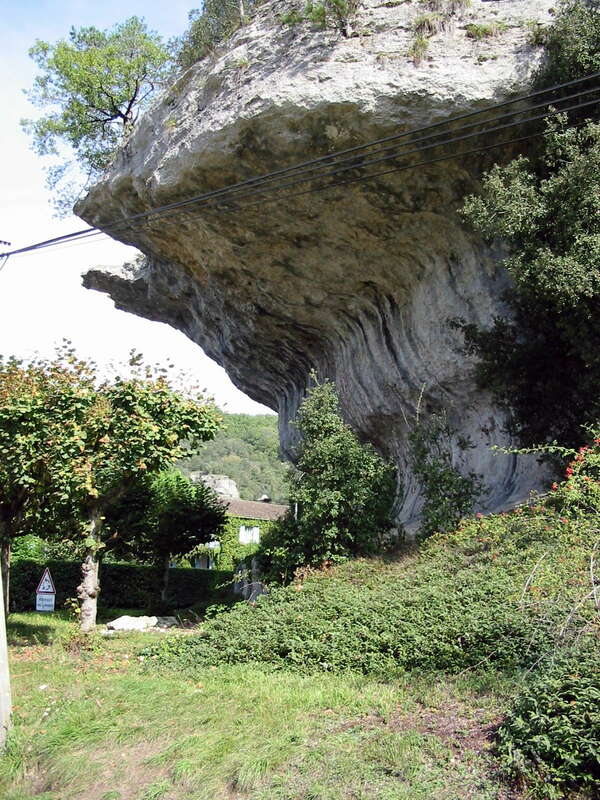 The book says that it comes from a French Pyrenees rock shelter, but no other information is given. It comes from Isturitz, and is of Magdalenian age. My thanks to Marion for bringing this excellent book to my attention. Another photo of the object above, apparently of the original. The web page says it comes from Isturitz, it is ten centimetres long, and that on the other side is the image of a bison and the rump of another. The barbed signs are apparently not uncommon in the art of Isturitz, and it assumes that the two figures are of women. This is a drawing of the two sides of the bone. It shows clearly the barbs on both sets of images. "A man lying naked, adorned with bracelets, reaches for a woman lying before him. The woman is strong and hairy, and on her thigh, an arrow with a triple row of barbs, the symbol of his conquest. 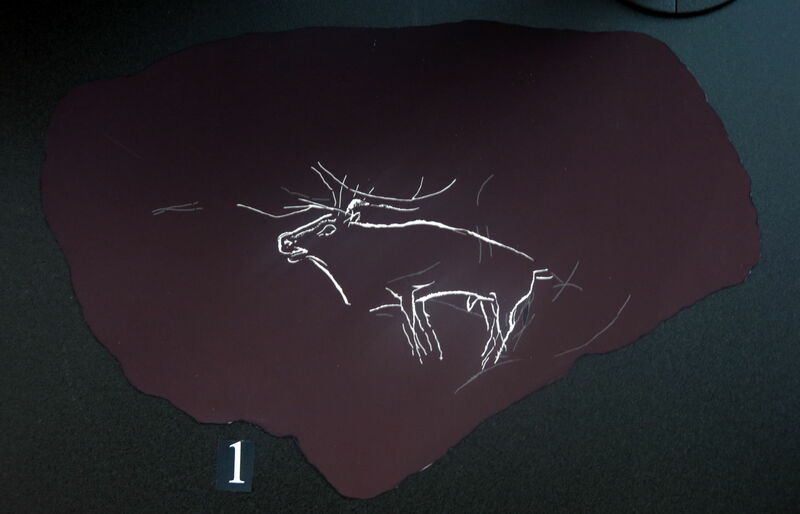 The engraving on the other side is not unrelated to the previous one: it is a bison male ready to mate with a female of which there are the hindquarters and tail erect, the male also has on the shoulder of barbed arrows. Source: Figure taken from the book of Heuvelmans et Porchnev, p. 430. And yet another image, this one showing the reverse side, with the two bison. Note that the breast of the woman in front is lying flat on her chest, as though she is standing up. 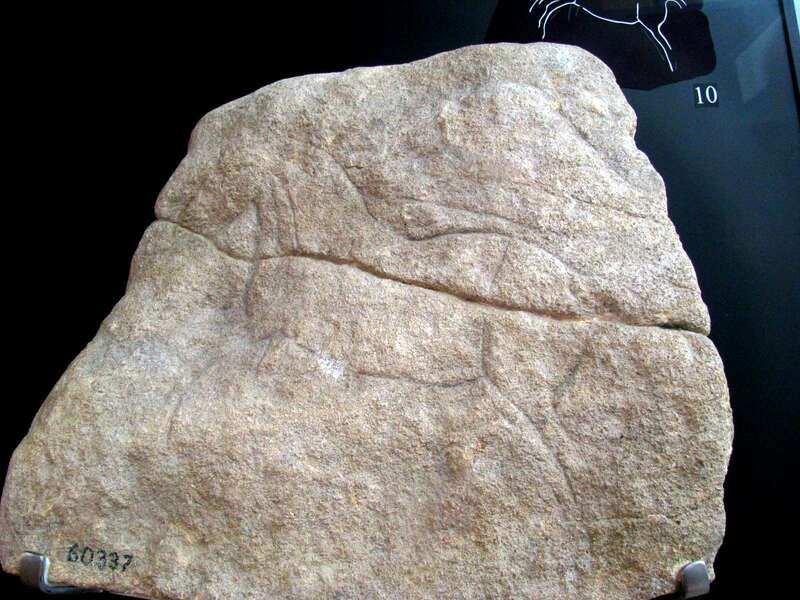 Horse engraved on a stone block, Magdalenian. ( As far as I can make out, baguette demi-rondes were fixed to a shaft, (somehow!) and the reason for the half round shape, i.e. 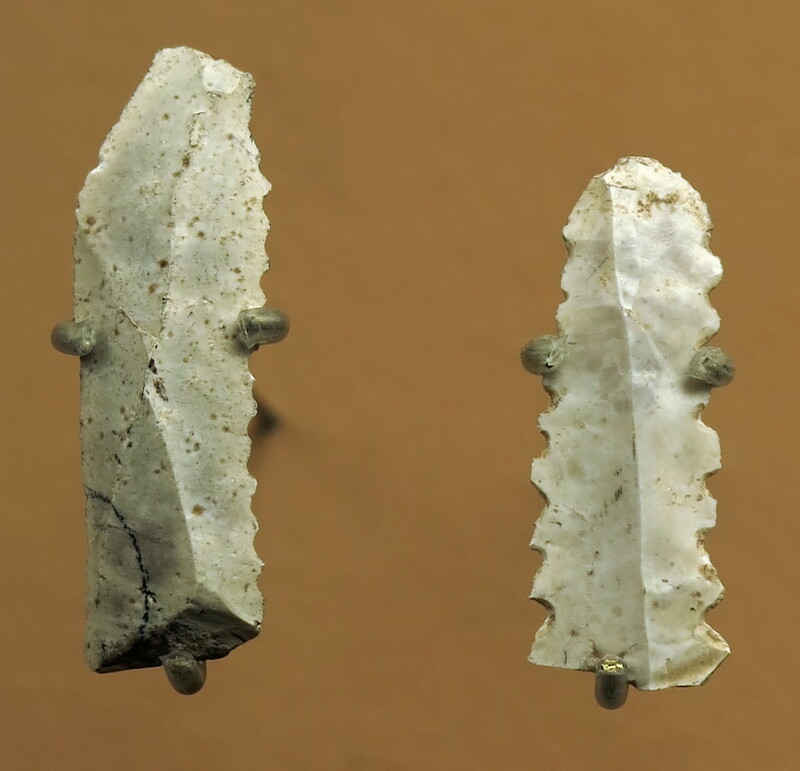 round on one side, flat on the other, is that they were tied together around a flint (or bone or ivory I suppose) projectile point, with the flat sides against the point and each other, the round shape towards the outside. Thus the two round sides made a roughly cylindrical shape, which could then be, say, inserted in a socket in the spear shaft and secured in some way. 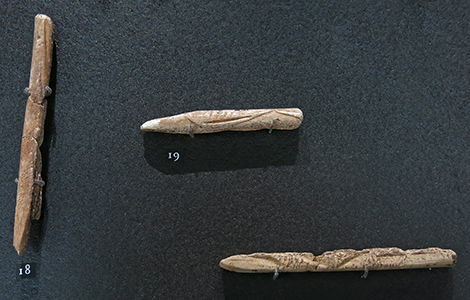 The end of the spear shaft could also have been whittled down to a tongue shape, flat on both sides, around which the two baguette demi-rondes were placed and secured with cord. If I was doing it, that's what I would try first. The darts weren't really of a large enough diameter to be able to carve a hole to accept the baguette demi-ronde. 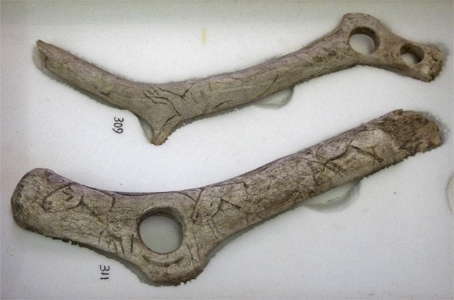 Harpoon shafts, however, were used more as thrusting spears as far as I can work out, so they could be of a much larger diameter, into which you could carve a socket. Birch bark glue may have been used, and the glue would also have been used to strengthen the cords holding the two halves together. Birch bark glue is a very difficult glue to make, but the technique was well understood at that time. The advantage is that if the flint is broken by impact with the ground or a bone, you can simply insert another flint head, attach it with cord or a leather thong, and you are ready to hunt again. 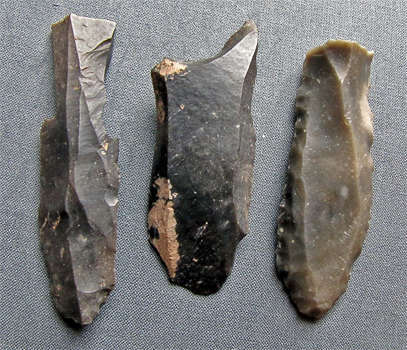 You then only have to carry a few spear shafts and many light and easily packed flints when you go on a hunt, apart from the other things you need. The spears used are more properly referred to as darts, they were not the strong thrusting spear as used by, say, the Romans, but a long, thin, whippy piece of wood. The ability to bend is an integral part of why they are able to be thrown such long distances. The bend stores up energy which is released in the form of extra speed as it leaves the spear thrower, and the spear straightens. I emphasise that this is all conjecture on my part, I have been unable to get anything more than very unsatisfactory allusions to the technique. However the idea of a fore-shaft is one that was used in a number of cases, and especially for harpoon heads. 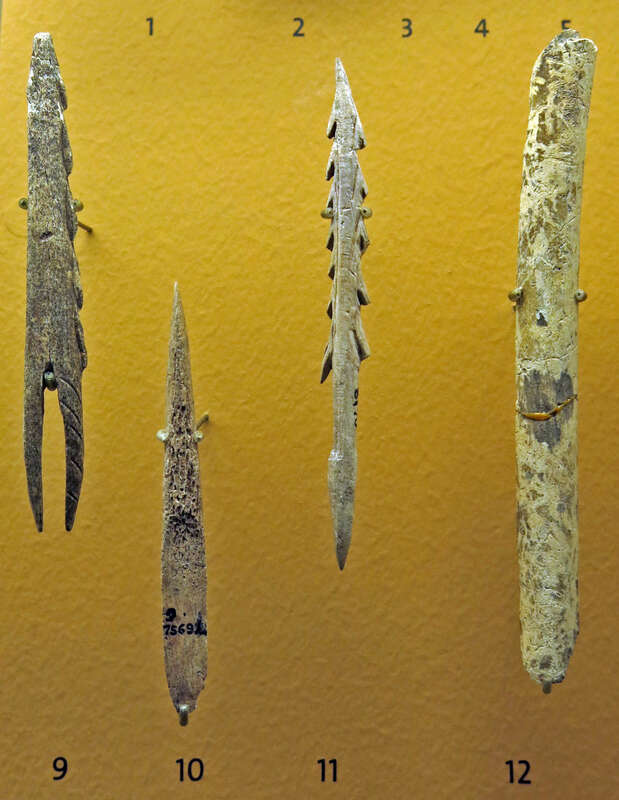 Methods were needed to attach bone or ivory harpoon heads to the shaft of the harpoon, and I've heard of sockets being used in that instance. 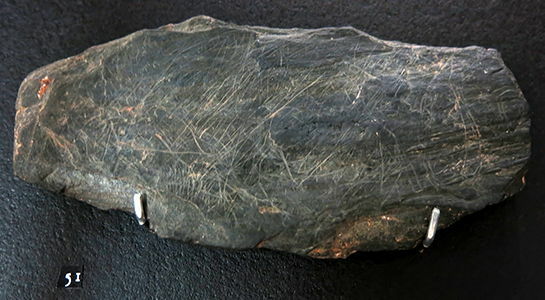 Based on the compiled information, a new hafting method for Clovis points is put forth that links the attributes of bi-beveled rods to a specific role within this system. 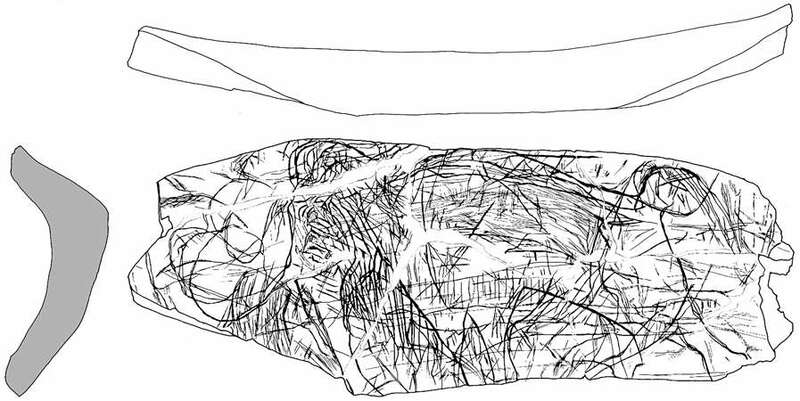 This new hypothesis suggests that bi-beveled rods were tied facing each other around a Clovis point and a main shaft as part of composite clothes pin-like foreshafts. 7, 8, 9 - Baguettes demi-ronde, with another small carved baguette below them. 10, 11 - Bâton percés. From La Madeleine. Note that the Bâton percé at number 10 is a small, delicate example, as though it was made to straighten lighter, thinner diameter darts. 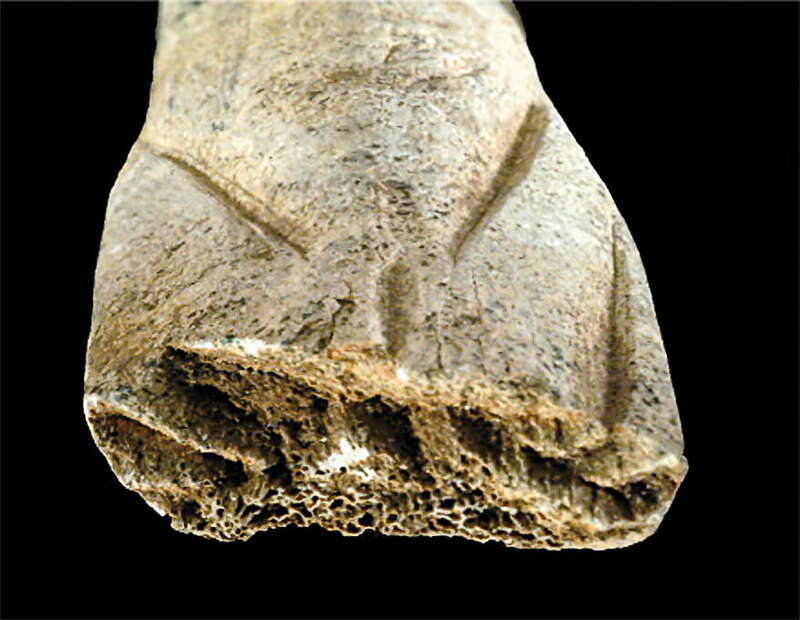 Magdalenian two sided harpoon with five barbs, from l'abri de La Madeleine, in reindeer antler. Dimensions: 147 mm long, 28 mm wide, 12 mm thick. 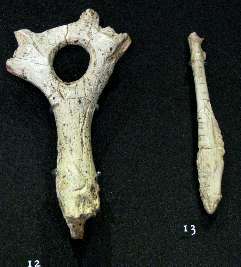 (left): Magdalenian reindeer antler from Laugerie Bassewith the beginnings of a perforation to make it into a bâton percé. 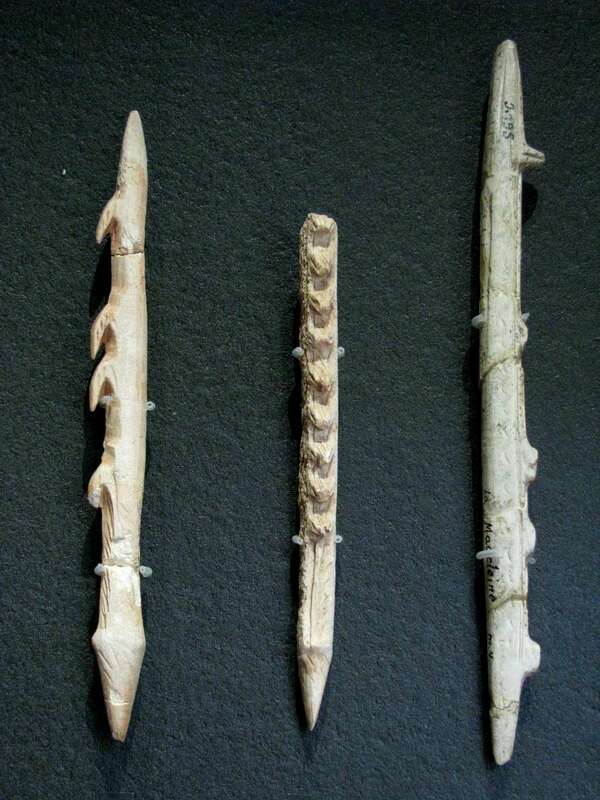 Magdalenian bone eyed needles from la grotte de la Vache. (left): Dimensions: length 55 mm, width 3 mm, thickness 2 mm. (centre): Dimensions: length 46 mm, width 3 mm, thickness 2 mm. (right): Dimensions: length 31 mm, width 3 mm, thickness 2 mm. First, two long grooves were made in a suitable long bone using a burin, with two short grooves at either end, completing a long thin rectangle. This was then split using a wedge or ciseau, to break open the grooves made in the hollow bone, and the rectangle was carefully levered out. 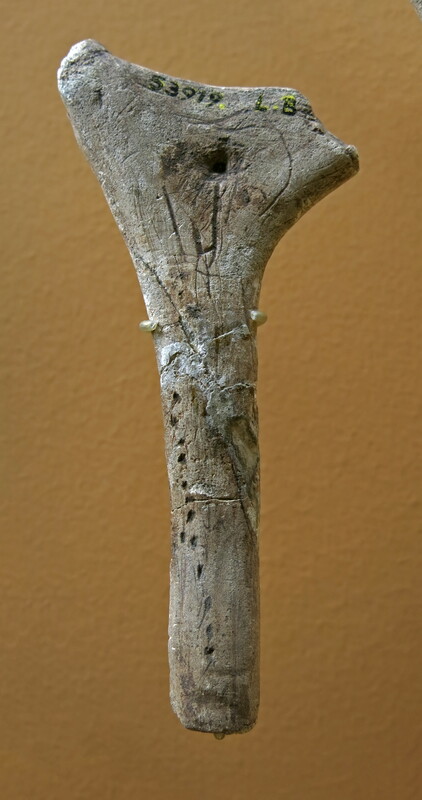 This is why reindeer antler was rarely used for this purpose, since it was easier to make it from bone, which is hollow, and takes a very sharp point. 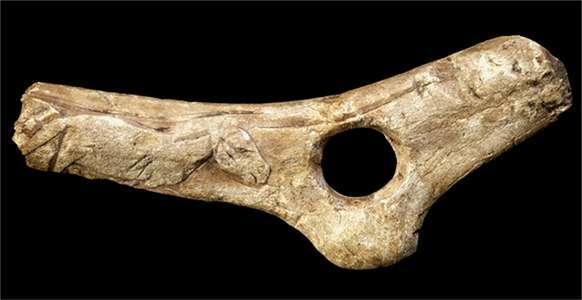 The eye was then put into the rectangular piece of bone at this point, while there was still plenty of 'meat' around the hole being made, and the needle was then carefully sanded and polished into shape. 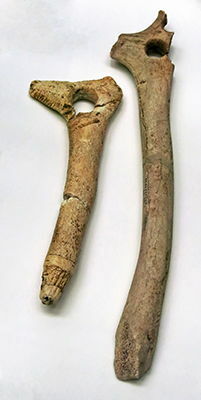 (left): Magdalenian harpoon with one barb, from la grotte de La Vache, in reindeer antler. Dimensions: 89 mm long, 8 mm wide, 6 mm thick. 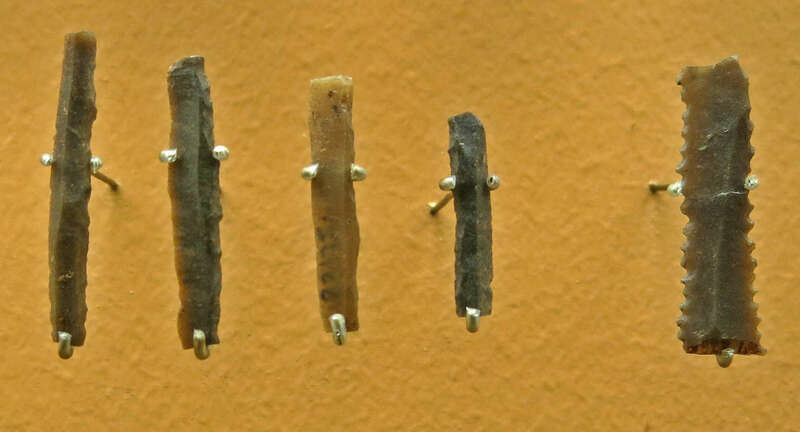 (centre): Magdalenian harpoon with two barbs on one side, from la grotte de La Vache, in reindeer antler. Dimensions: 86 mm long, 10 mm wide, 6 mm thick. (right): Magdalenian harpoon with three barbs on one side, from la grotte de La Vache, in reindeer antler. 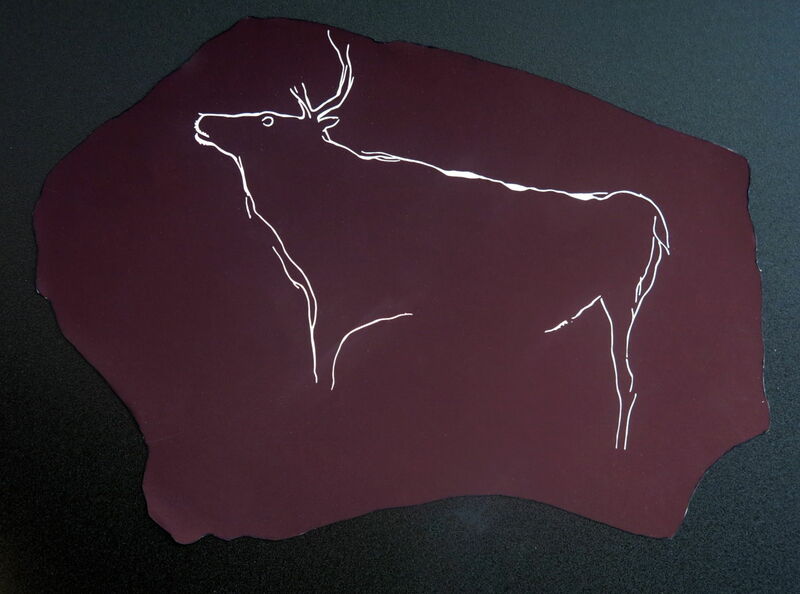 Dimensions: 110 mm long, 12 mm wide, 7 mm thick. (left): Magdalenian one sided harpoon originally with four barbs, of which three remain, from la grotte de La Vache, in reindeer antler. Dimensions according to the catalog: 139 mm long, 140 mm wide, 70 mm thick. 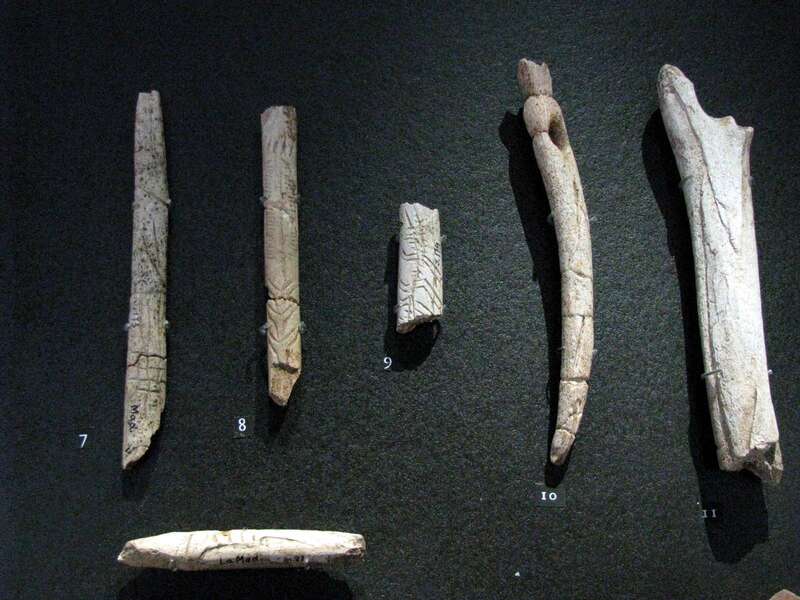 (right): Magdalenian one sided harpoon with six barbs, though there may originally have been more, from la grotte d'Isturitz, in reindeer antler. Dimensions: 173 mm long, 13 mm wide, 8 mm thick. 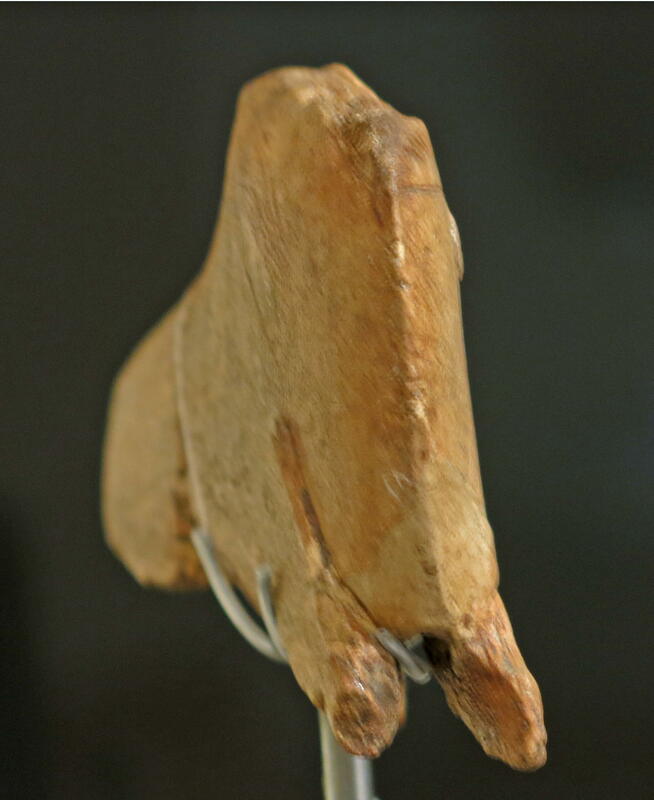 Magdalenian two sided harpoon with ten barbs, from la grotte de La Vache. Dimensions: length 105 mm, width 14 mm, thickness 9 mm. 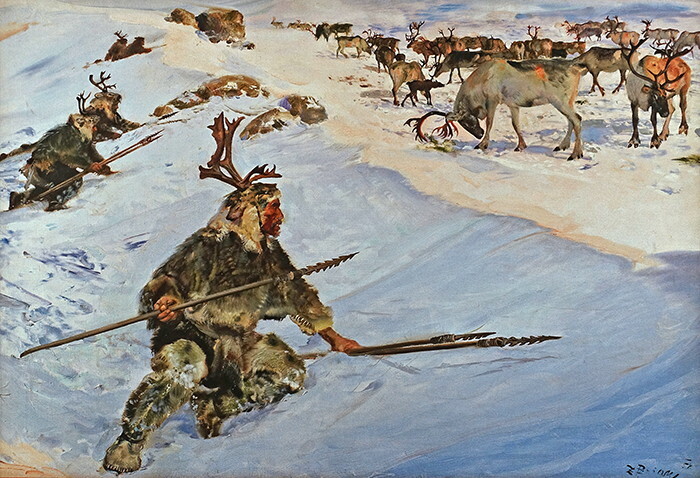 A winter hunting scene in Magdalenian times. Note that spears with harpoon heads are shown, but no spear throwers form part of the kit in this recreation by the talented artist Zdeněk Burian, 1905 - 1981. 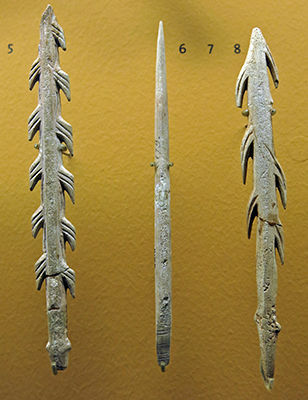 (left): Magdalenian foëne or fish spear from la grotte de La Vache. Dimensions: length 61 mm, width 19 mm, thickness 5 mm. 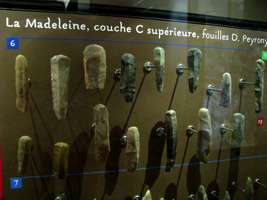 (right): Magdalenian foëne or fish spear from la grotte de La Vache. Dimensions: length 71 mm, width 21 mm, thickness 8 mm. 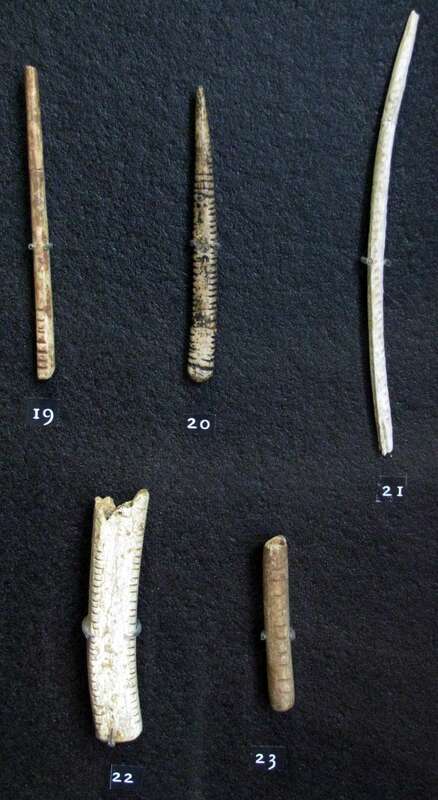 These are points of reindeer antler which were attached to a long shaft, used for catching flatfish, particularly while wading in shallow waters. Its handle could be equipped with a cord, enabling the spear to be retrieved when thrown at a fish. In particular, foëne were often used for eel fishing, the extra points making it possible to catch these fish, which are slippery and difficult to catch otherwise. It is speculated that they may have been used to take down birds as well. (right): Magdalenian spear point with a simple pointed base, from la grotte d'Isturitz. Dimensions: length 71 mm, width 7 mm, thickness 5 mm. (left): Magdalenian spear point with a trimmed base, from la grotte du Placard . 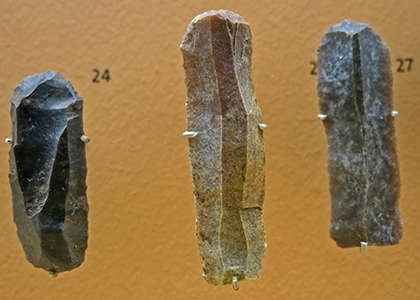 (right): Magdalenian spear point with a trimmed base, from la grotte de La Vache. Dimensions: length 96 mm, width 8 mm, thickness 7 mm. 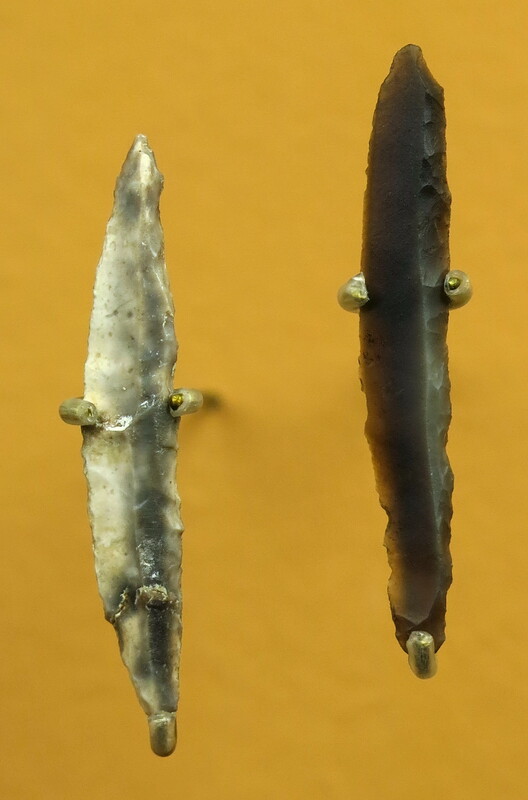 (left): Magdalenian spear point in reindeer antler, of the Lussac-Angles type, from la grotte d'Isturitz. Dimensions: length 62 mm, width 11 mm, thickness 8 mm. 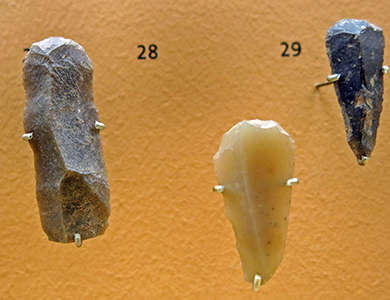 (centre): Magdalenian spear point in reindeer antler, of the Lussac-Angles type, from la grotte d'Isturitz. Dimensions: length ? mm, width 9 mm, thickness 8 mm. (right): Magdalenian spear point with a single bevel in reindeer antler from la grotte d'Isturitz. Dimensions: length 114 mm, width 12 mm, thickness 11 mm. 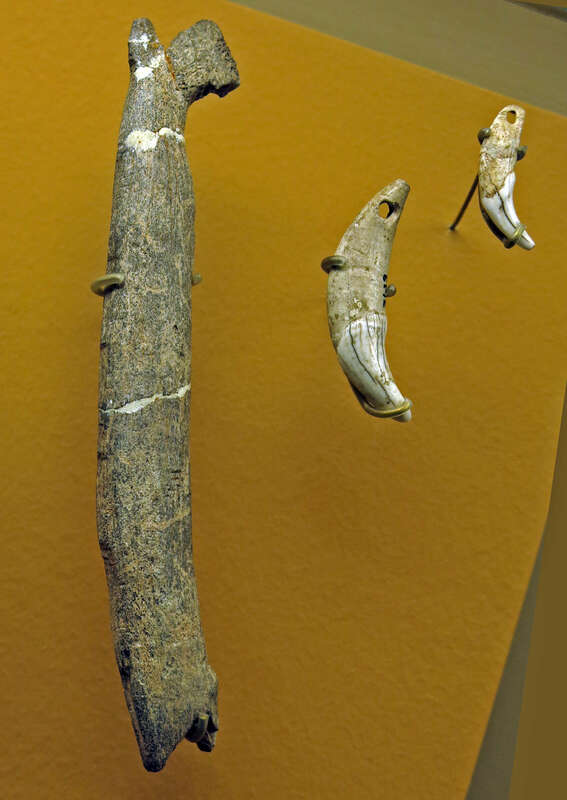 (left) Magdalenian spear point with a double bevel in reindeer antler from la grotte de La Vache. Dimensions: length ? mm, width 9 mm, thickness 7 mm. (right) Magdalenian spear point with a double bevel in reindeer antler from la grotte de La Vache. Dimensions: length 76 mm, width 8 mm, thickness 6 mm. (left) Magdalenian spear point with a forked base in reindeer antler from la grotte d'Isturitz. Dimensions: length 108 mm, width 8 mm, thickness 7 mm. 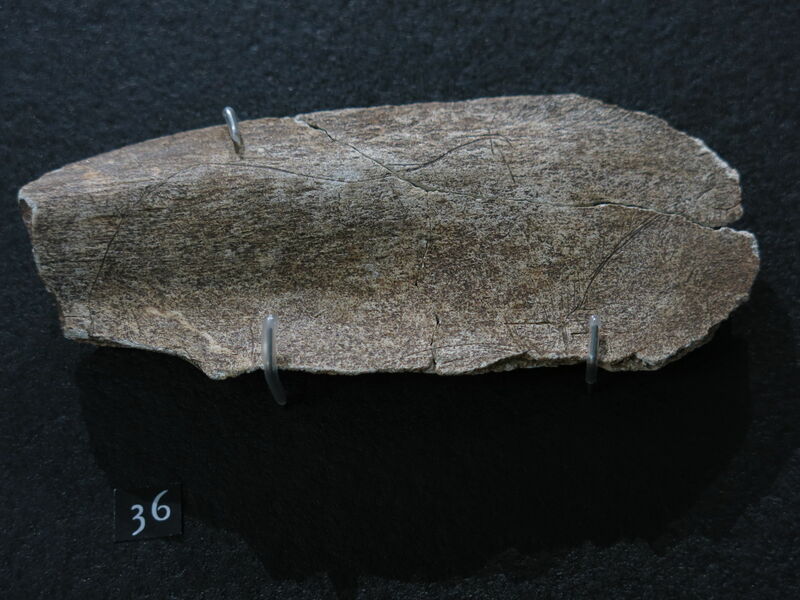 (right) Magdalenian spear point with a forked base in reindeer antler from la grotte d'Isturitz. Dimensions: length 87 mm, width 8 mm, thickness 6 mm. Magdalenian baguette demi-ronde in reindeer antler from la grotte d'Isturitz. Dimensions: length 147 mm, width 13 mm, thickness 6 mm. (left): Magdalenian baguette demi-ronde in reindeer antler from la grotte d'Isturitz. No dimensions given in the catalog. 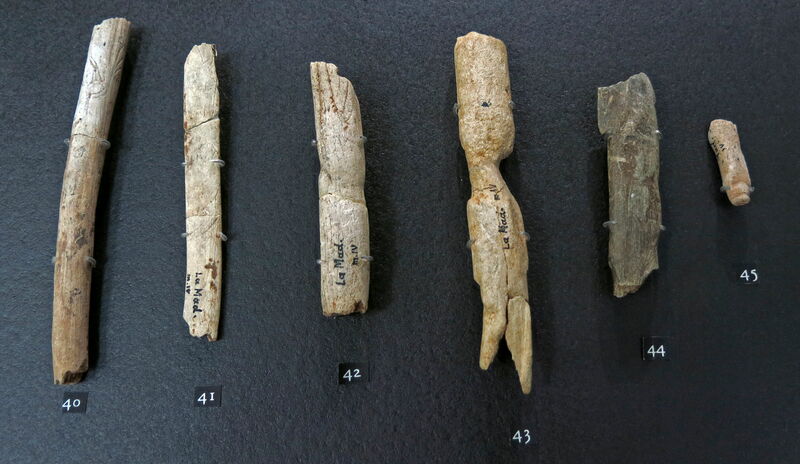 (right): Magdalenian baguette demi-ronde in reindeer antler from la grotte d'Isturitz. Dimensions: length 95 mm, width 11 mm, thickness 5 mm. 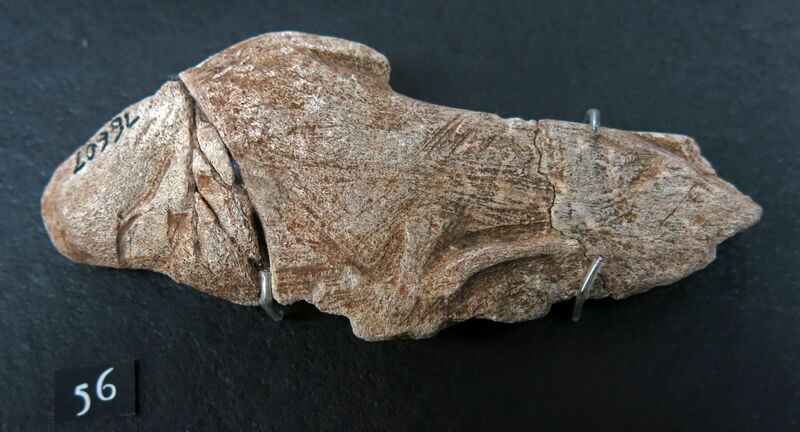 Magdalenian needle polisher from la grotte d'Isturitz. Dimensions: length 97 mm, width 59 mm, thickness 42 mm. 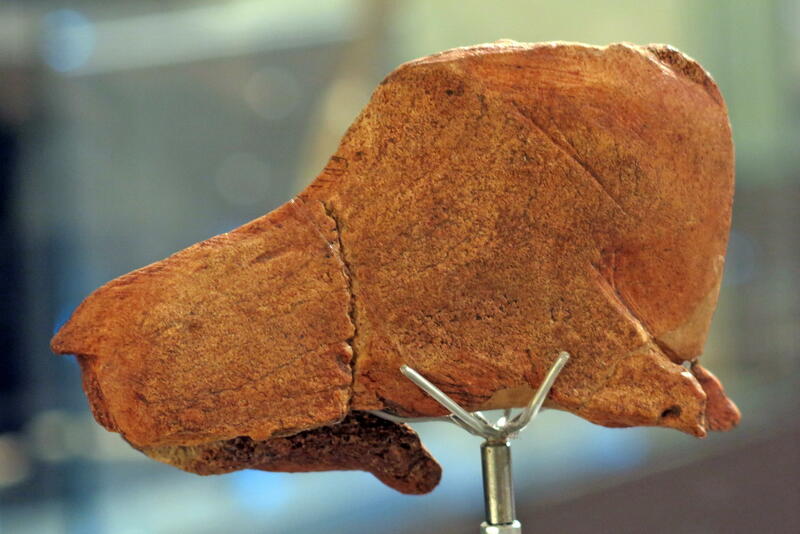 Magdalenian grooved reindeer antler from la grotte d'Isturitz. 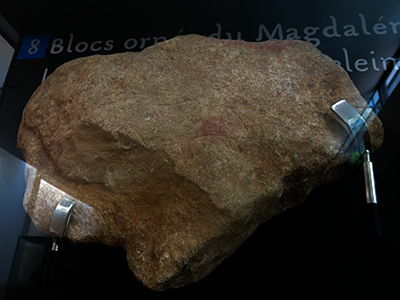 Magdalenian spear point with a single bevel from la grotte d'Isturitz. Dimensions: length 109 mm, width 9 mm thickness 9 mm. (left): Magdalenian point in flint from la grotte de la Mairie. (right): Magdalenian point in flint from lla grotte de la Mairie. 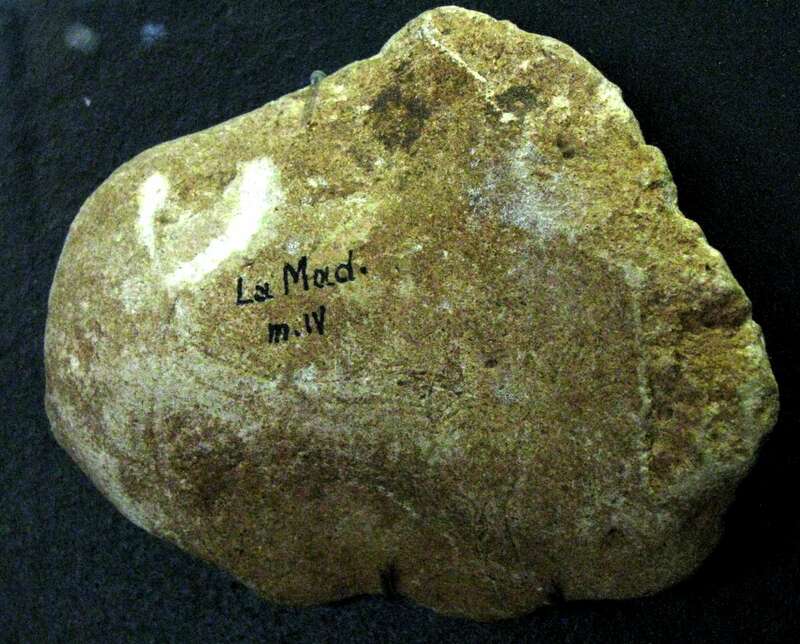 Magdalenian shouldered points, pointes à cran. Dimensions: length 42 mm, width 11 mm, thickness 2 mm. 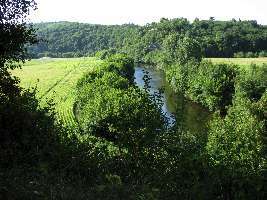 (right): Pointe à cran from the abri de La Garenne. Dimensions: length 42 mm, width 11 mm, thickness 3 mm. Magdalenian points of the 'Laugerie Basse' type. Crémades M., 1994: Oeuvres d'art mobilier inédites de la Madeleine (Tursac-Dordogne), (Fouilles J.M. Bouvier). 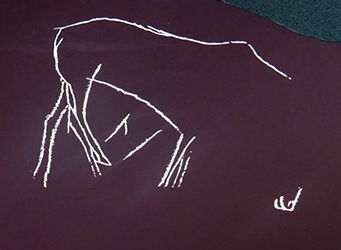 In: Paléo, N. 6,1994. pp. 233-246. Capitan L., Peyrony D., 1928: La Madeleine : son gisement, son industrie, ses oeuvres d’art. Paris, Librairie Emile Nourry, 1928. Peyrony, D., 1926 - Fouille de La Madeleine, Carnet de fouilles D. Peyrony, Archives du Musée national de Préhistoire, Les Eyzies-de-Tayac, p. 110-112. 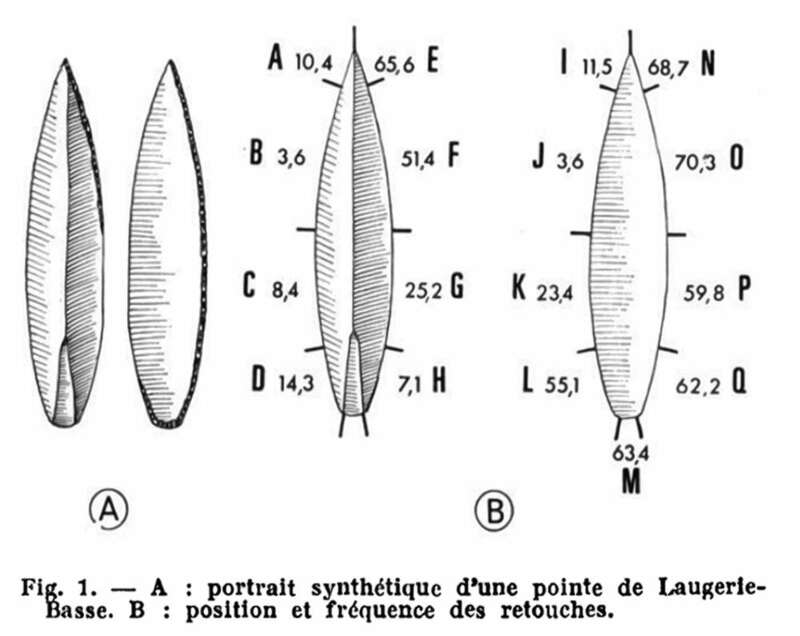 Peyrony, D., 1927 - Découverte d’un squelette humain à La Madeleine, Institut International d’Anthropologie, Amsterdam, 1927, 3, p. 318-320. Vialou D., 1991: La prehistoire (L'univers des formes), Gallimard (1991).